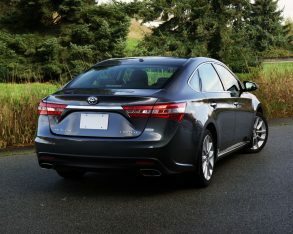 car, a common sight in the balding hills of Palm Springs, CA and Myrtle Beach, S.C., or anywhere else retirees are more populous than younger folks, but the third-gen model that followed reached out to a slightly younger demographic due to a more rakish design and much better performance, while the new fourth-generation Avalon could easily be chosen over any other full-size luxury model by just about anyone. 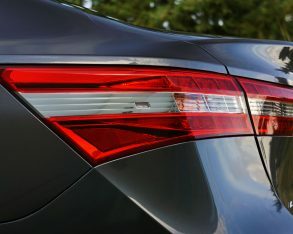 models in their respective segments, the Cressida’s Toyota-badged offspring continues to get better and better all on its own. 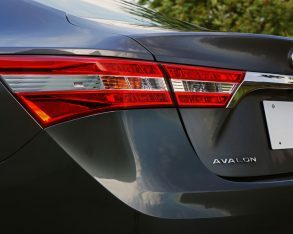 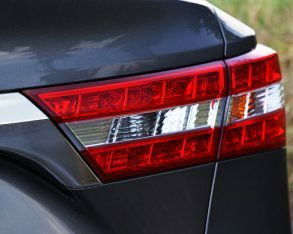 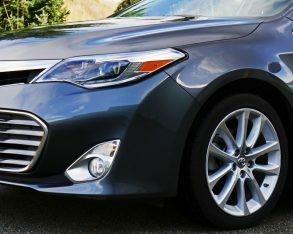 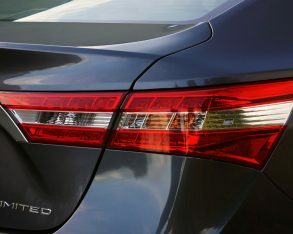 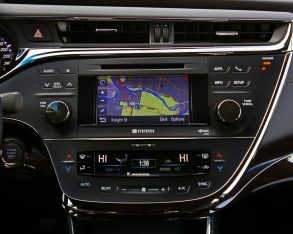 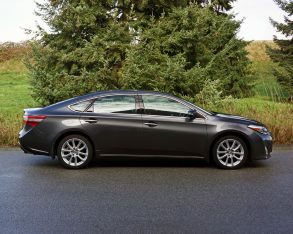 The Avalon actually rides on the same exact underpinnings as the Lexus ES, and in the U.S. can also be had in hybrid guise. 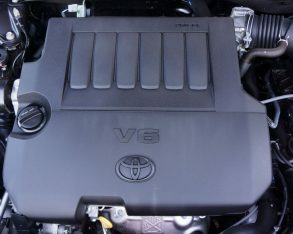 Here it’s strictly a 3.5-litre V6-powered near full-size front-driver, a great choice for those requiring the upper-tier fittings of a luxury car yet not wanting the showiness or prestige of a premium nameplate. 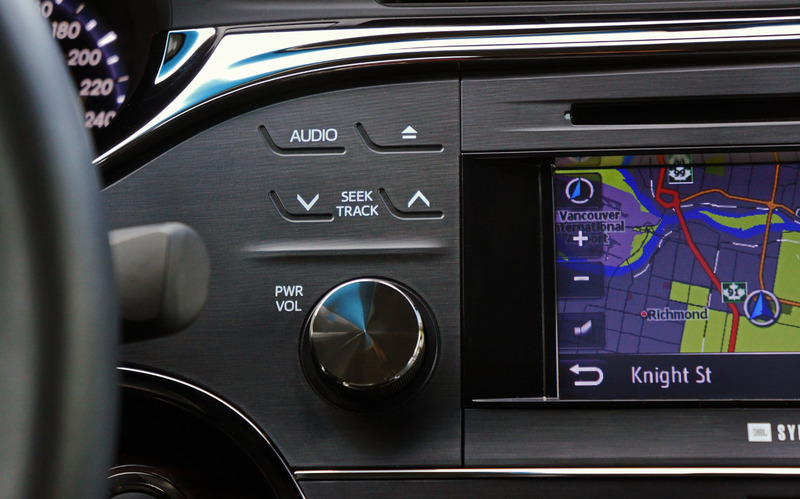 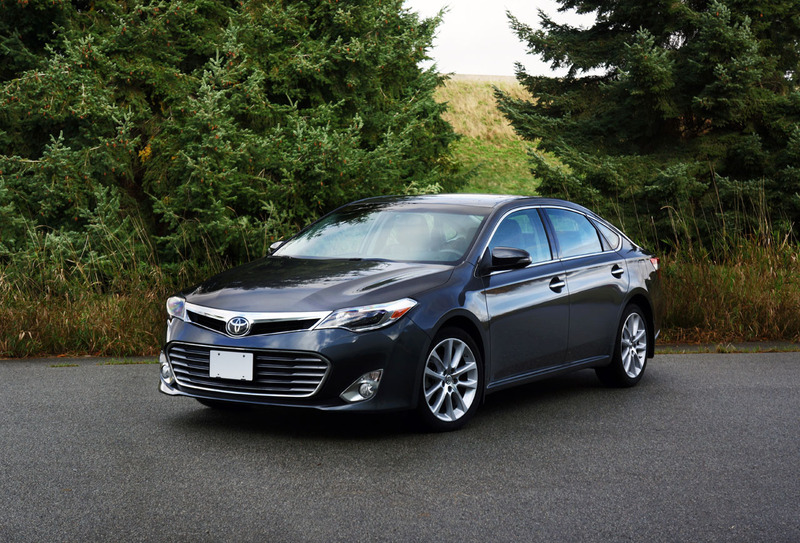 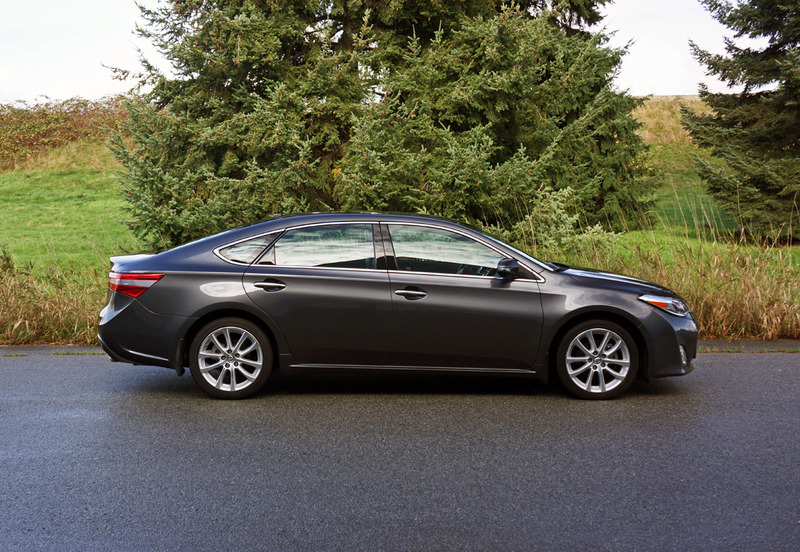 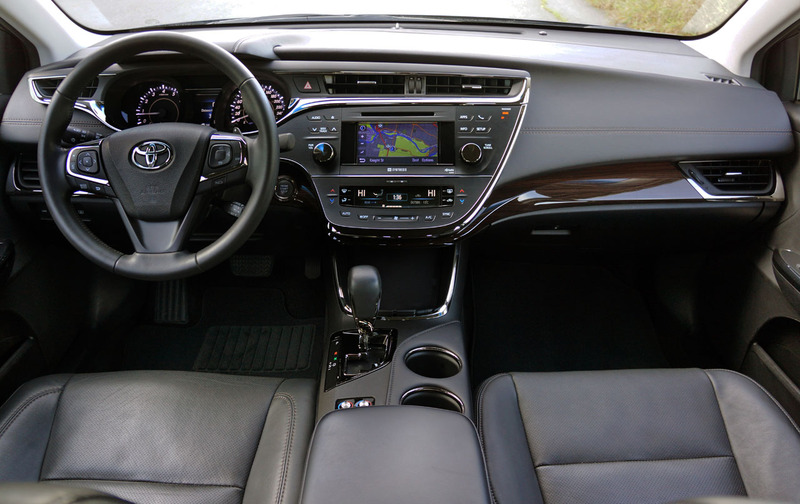 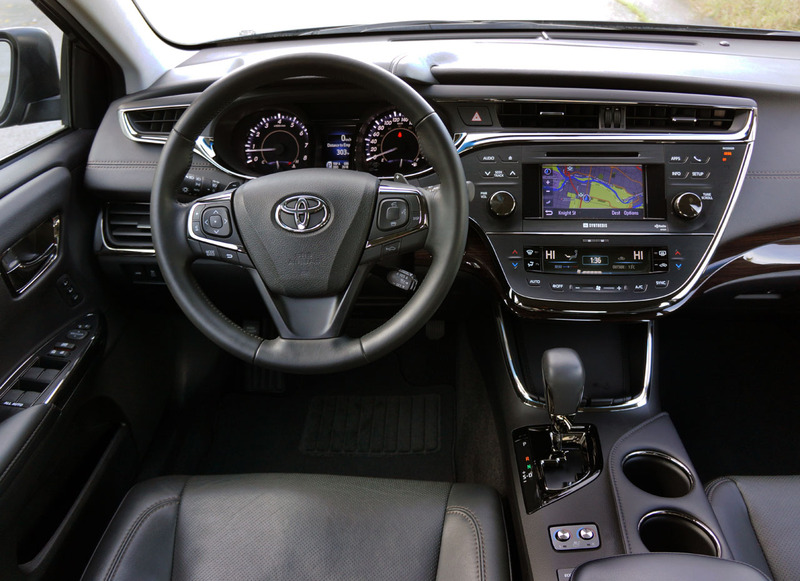 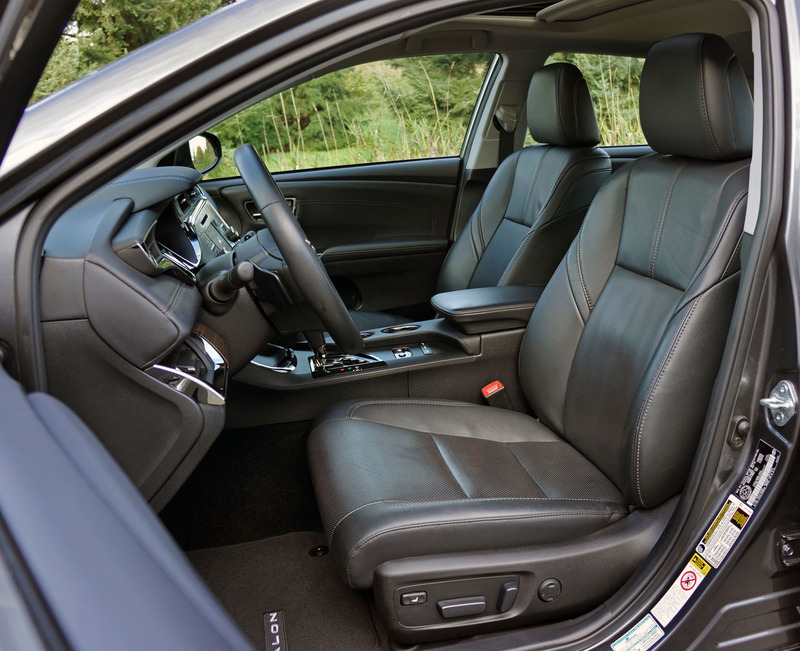 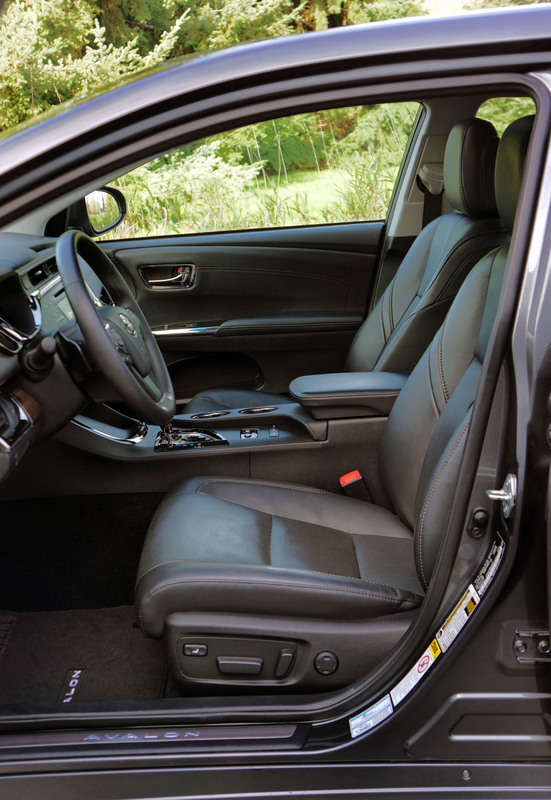 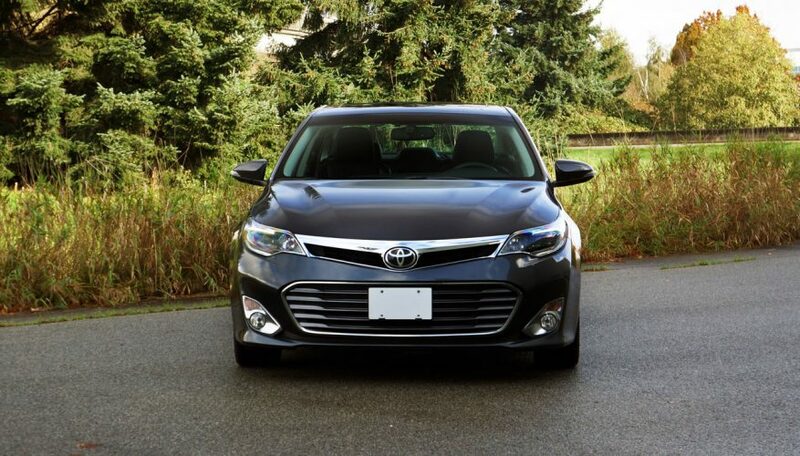 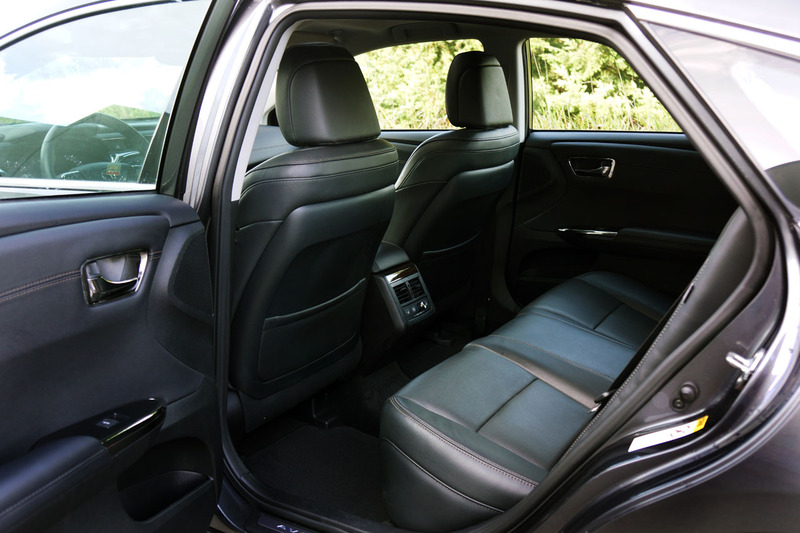 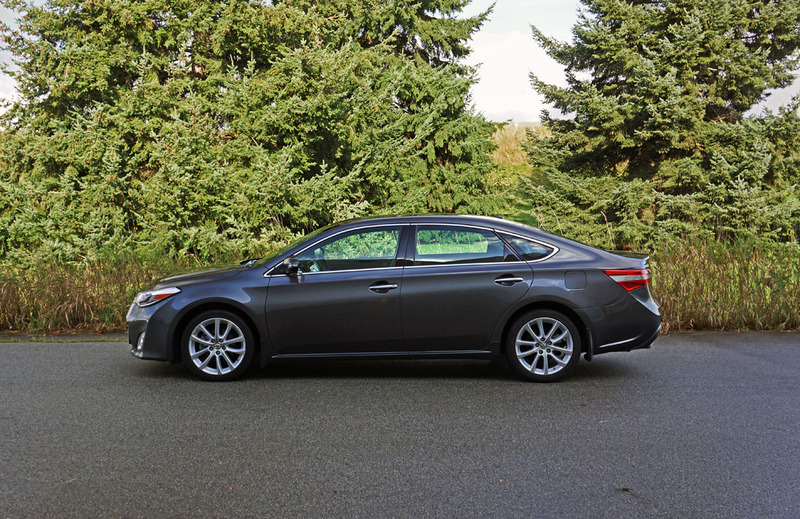 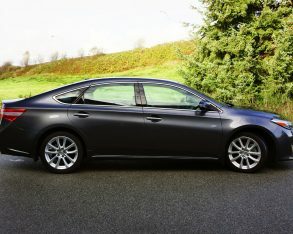 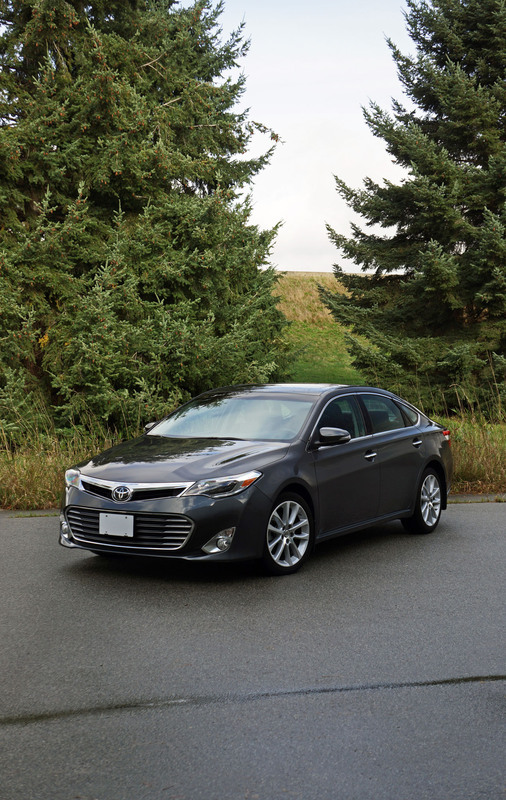 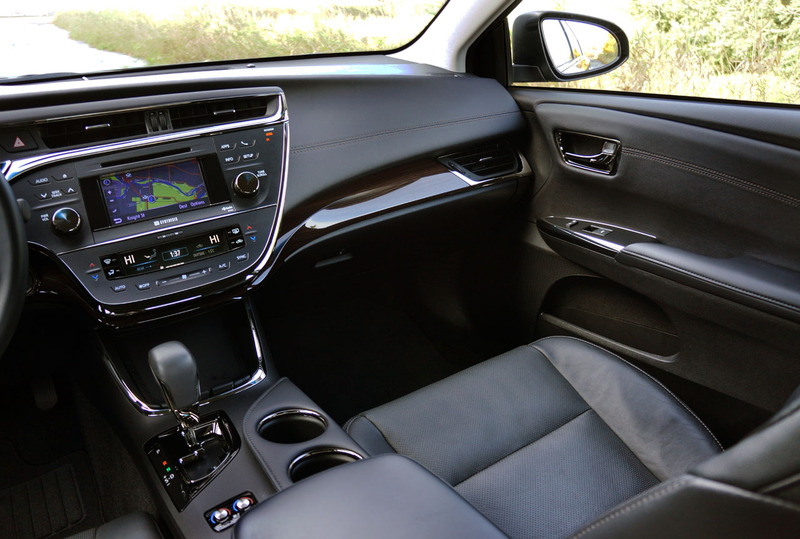 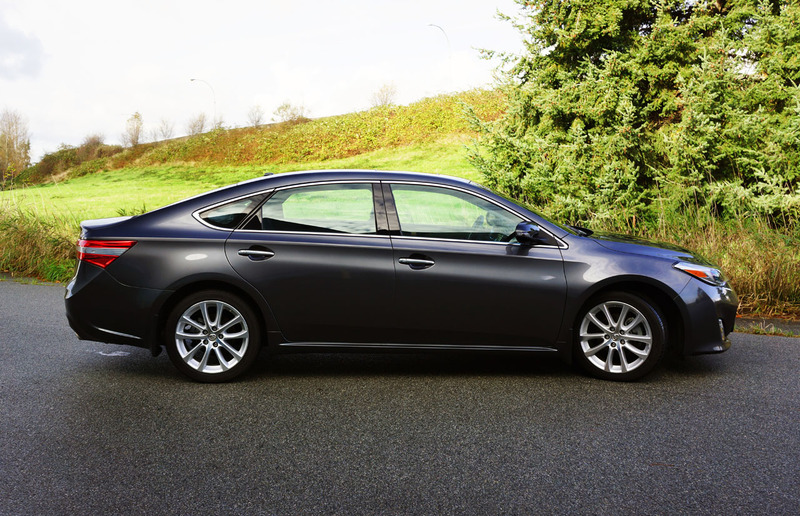 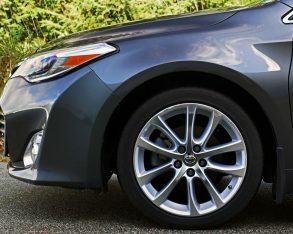 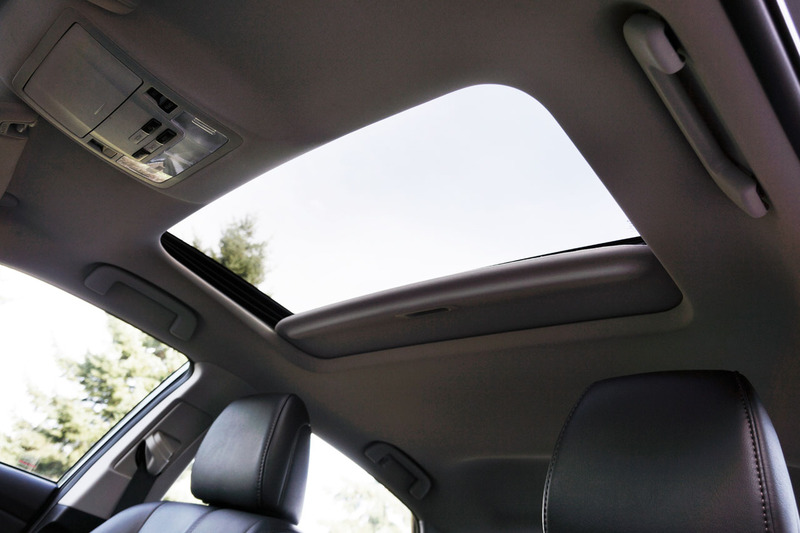 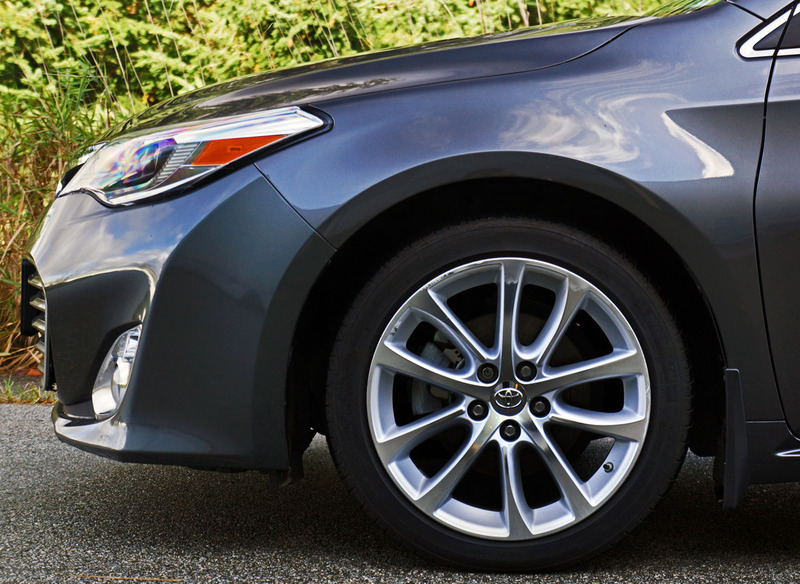 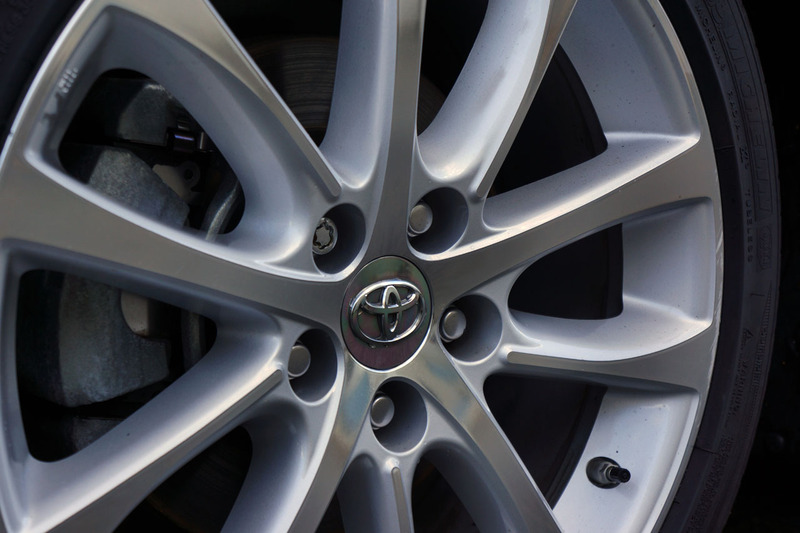 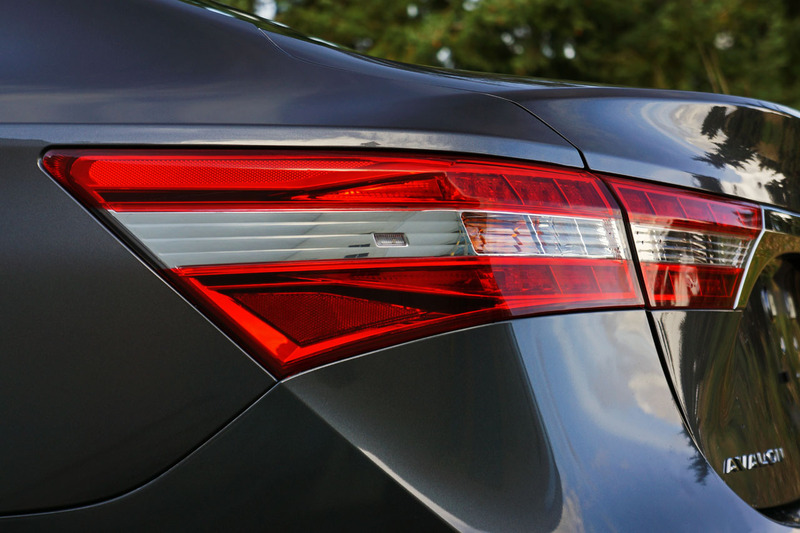 It ideally suits those who love their Camry XLE, yet want a little more style, size, and creature comforts. 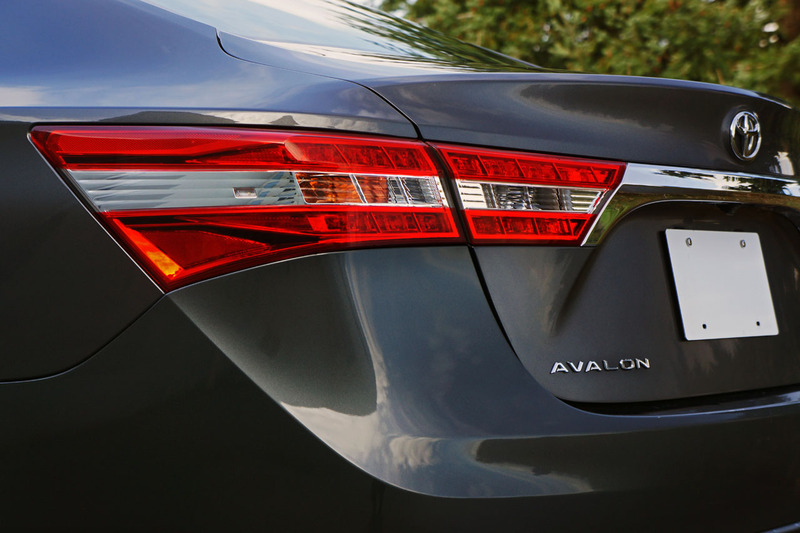 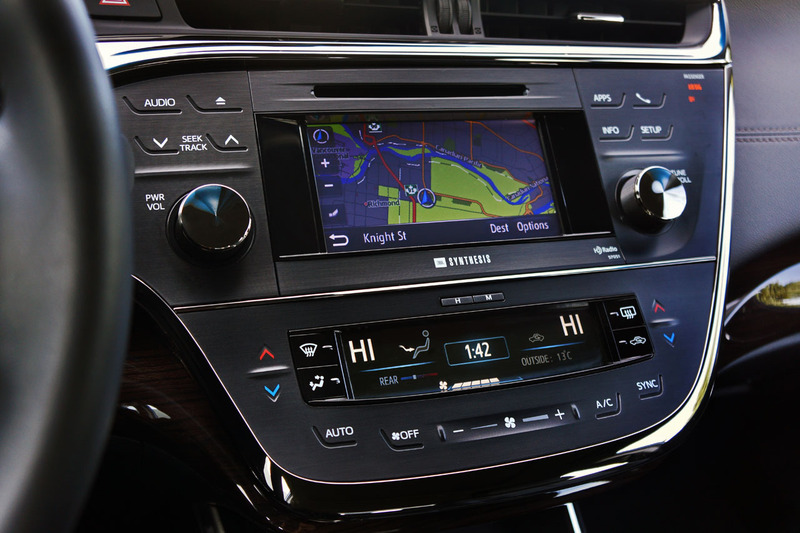 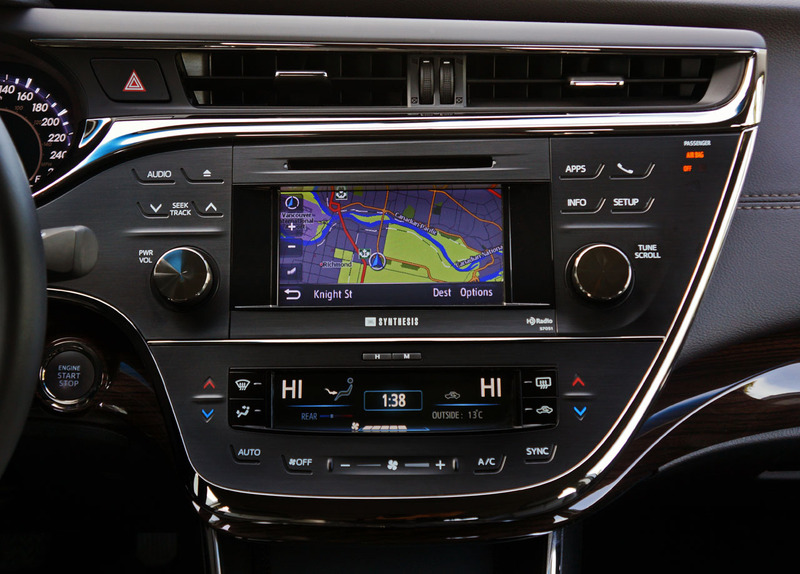 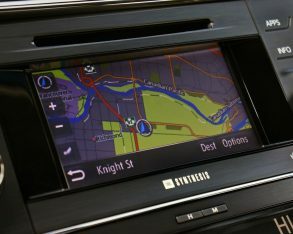 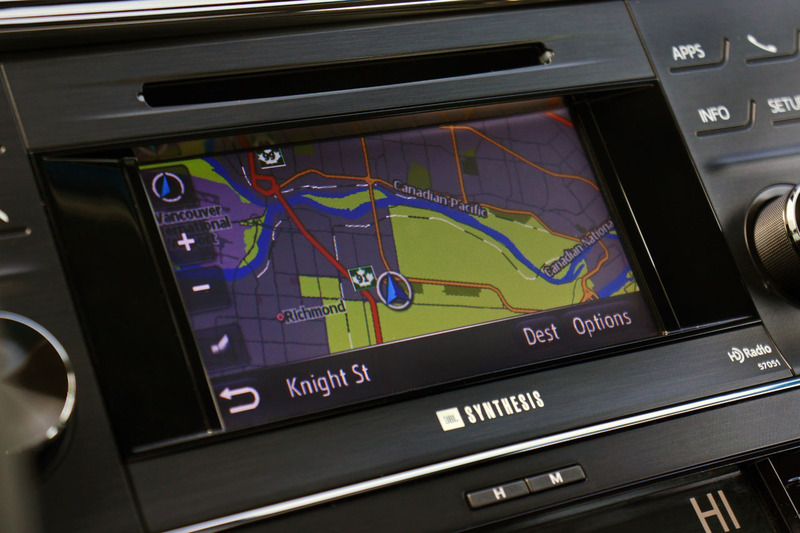 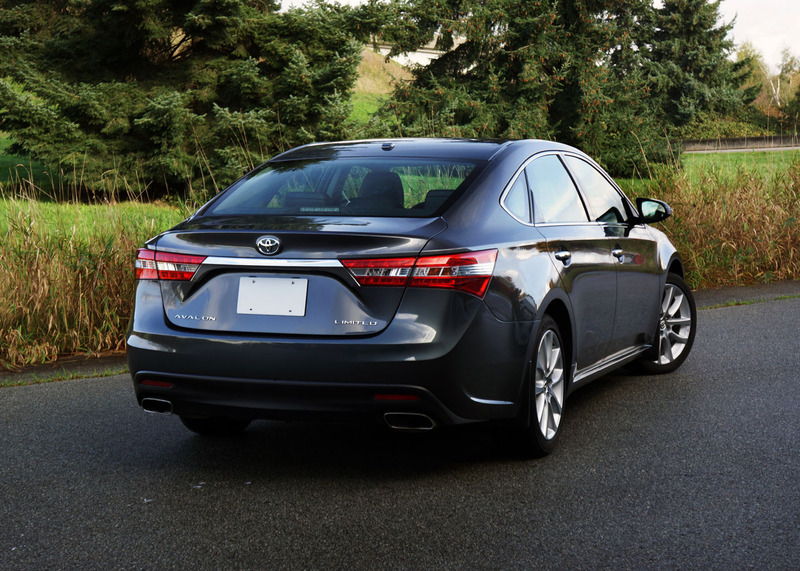 that end the Avalon is a midsize sedan owner’s dream machine. 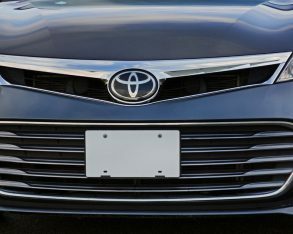 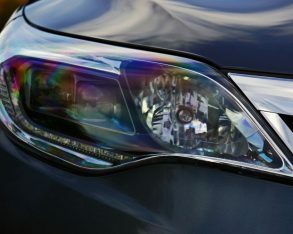 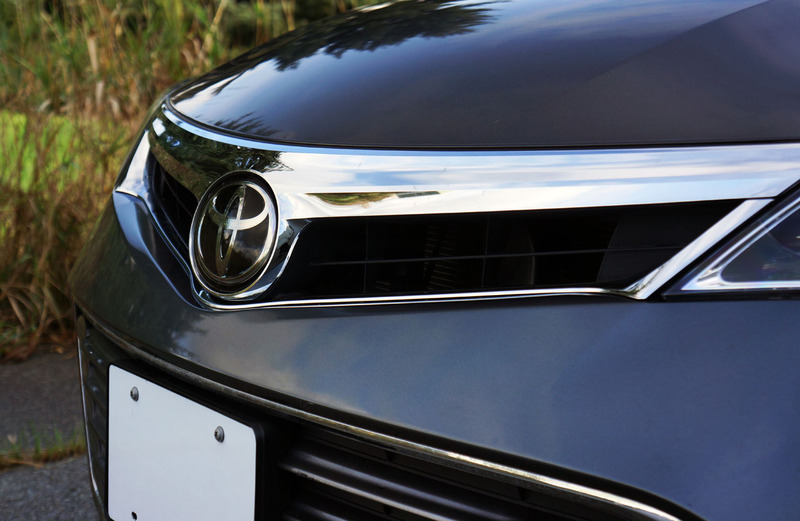 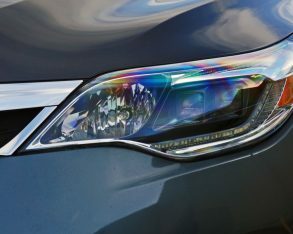 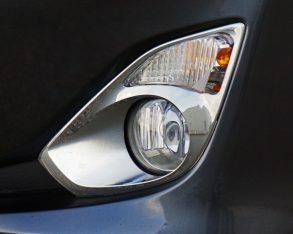 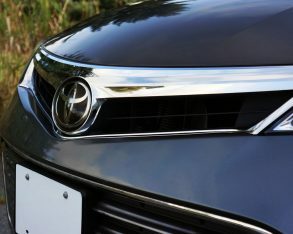 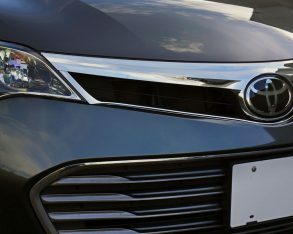 Its bold yet elegant front fascia combines Toyota’s trademark emblem-emblazoned chrome slashed upper grille with a big multi-slatted grille below for a premium look that could fit in at any country club, while optional LED daytime running lights and standard chrome-rimmed fog lamps bedazzle all those who might see it arriving. 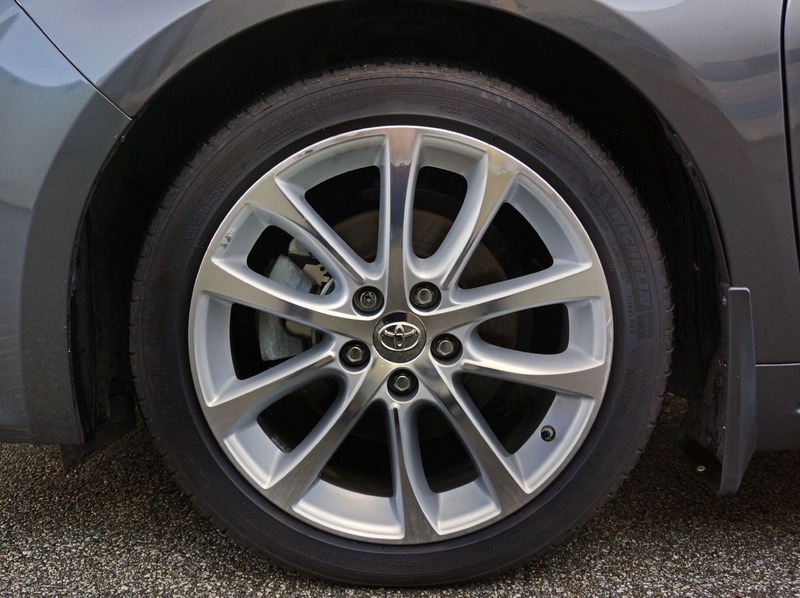 The Av’s long, lean lines, especially attractive in my tester’s dark Magnetic Grey Metallic paint, show off its extended wheelbase, my Limited tester’s 18-inch twin five-spoke alloys looking classy yet adding a touch of sport to the design. 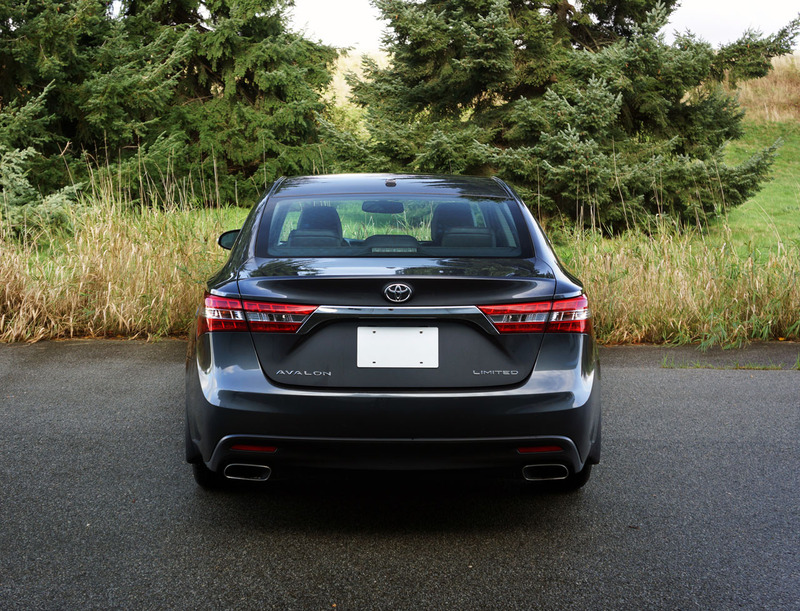 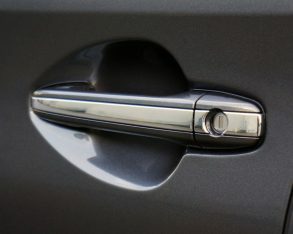 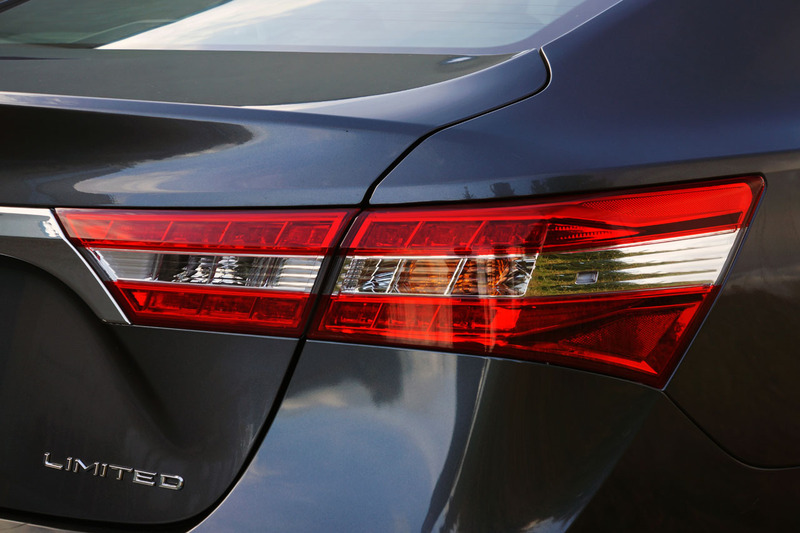 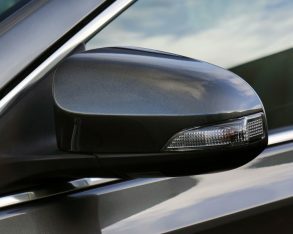 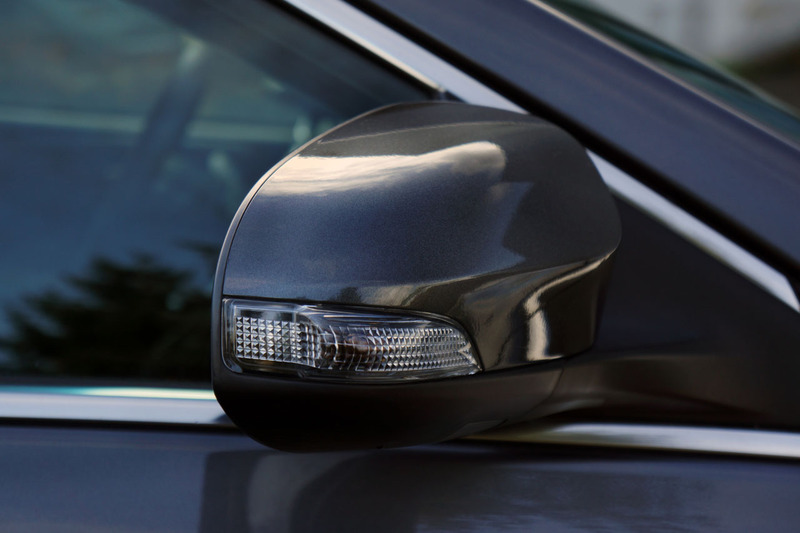 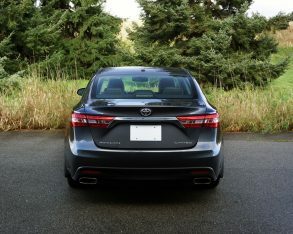 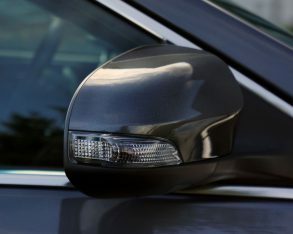 From end to end it’s a very attractive luxury sedan, the frontal design only improved on from the rear where sweeping rear glass culminates into a graceful set of perfectly shaped taillights. 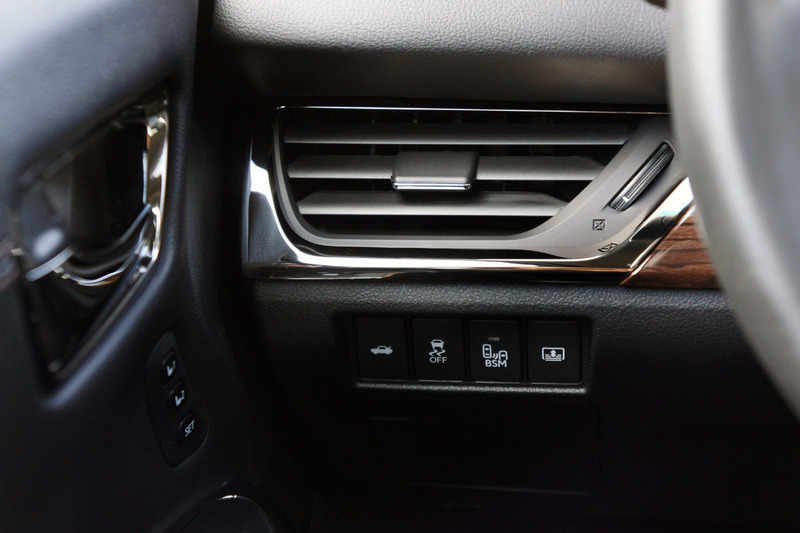 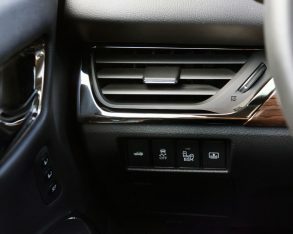 in the Av’s interior you’ll see that it all works very well, the darkened aspect of the chrome really helping to reduce its glittery effect and make it seem more like polished silver. 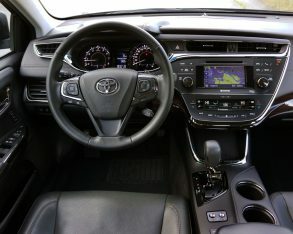 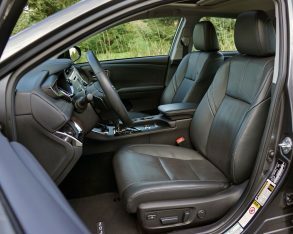 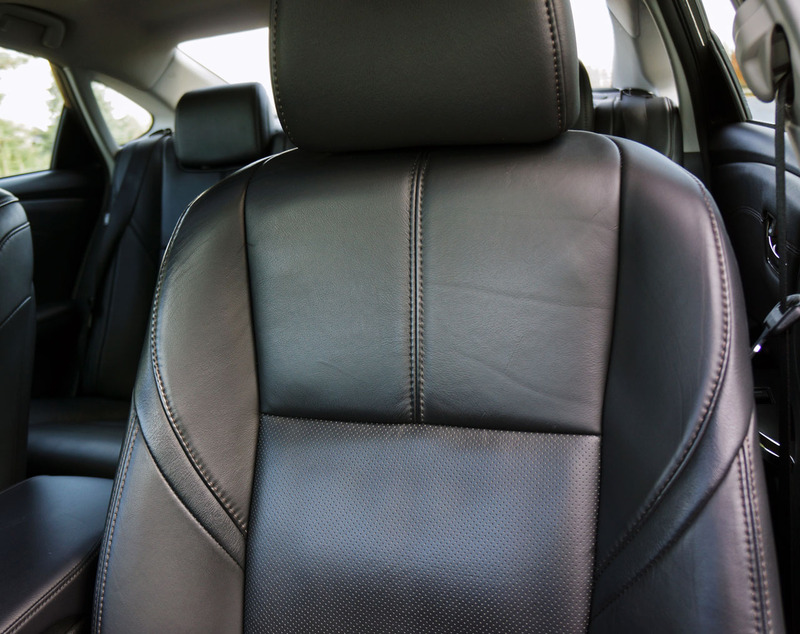 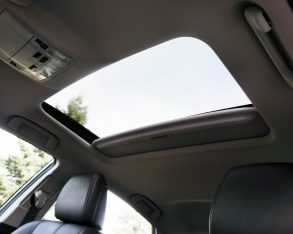 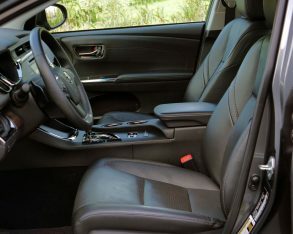 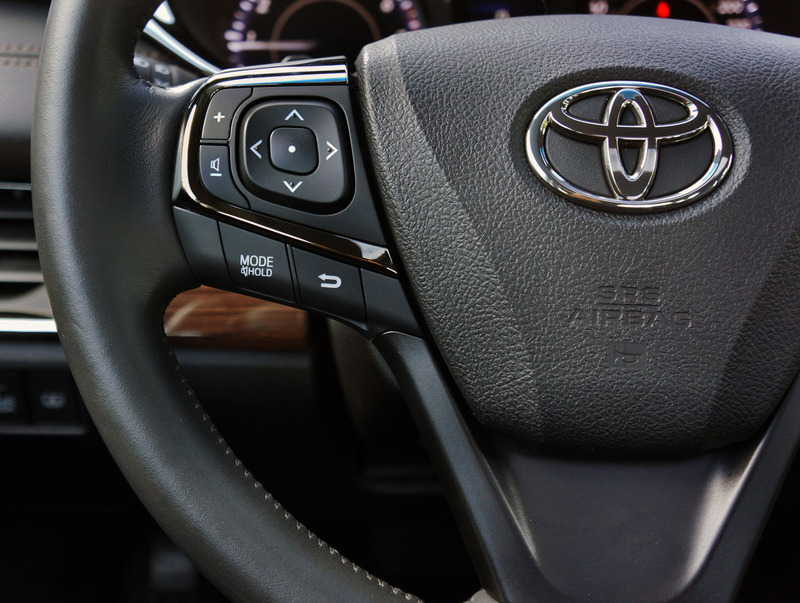 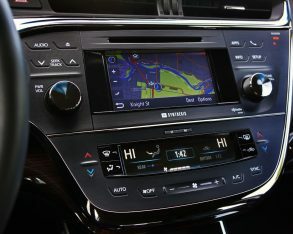 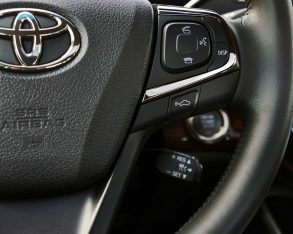 As you might have expected, Toyota didn’t miss a beat when it came to finishing its flagship model off with quality soft-touch plastics and leathers, even going so far to detail the dash-top in a stitched leather-like material that truly gives off a rich ambience. 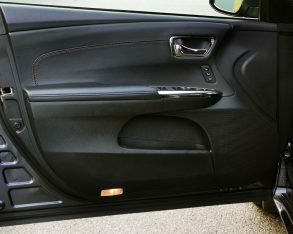 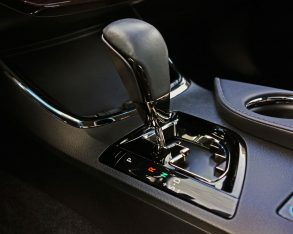 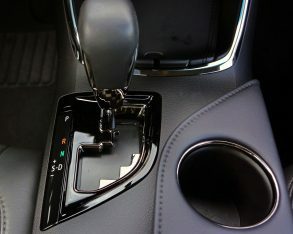 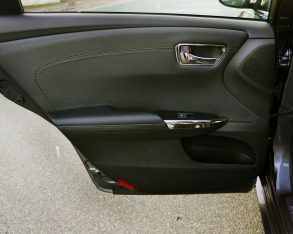 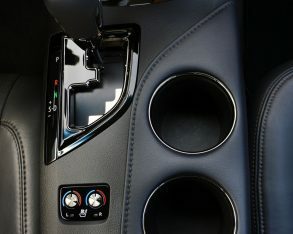 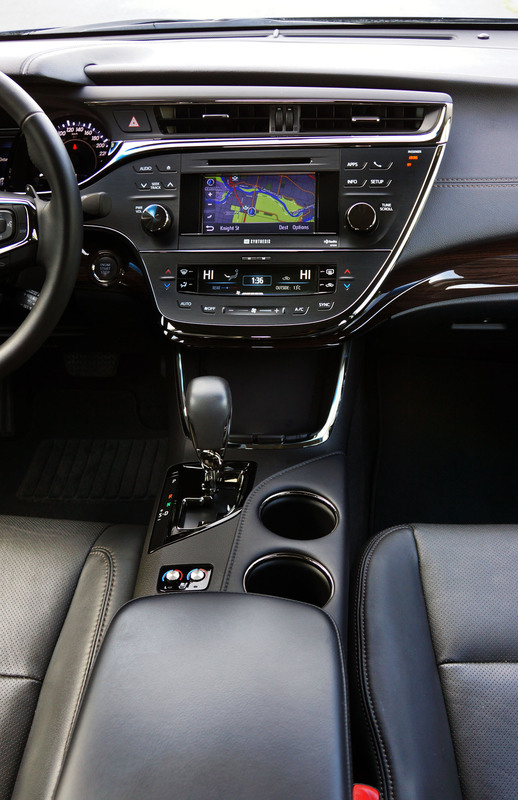 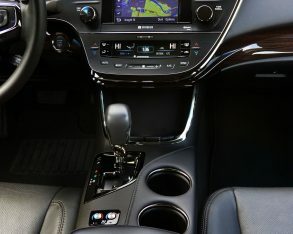 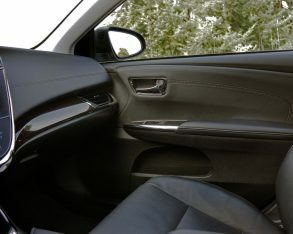 That material continues over to the door panel inserts and armrests, the centre console bin lid, the dual cupholder surround, and even the sliding lid overtop the console change tray that also houses the aux and USB plugs. 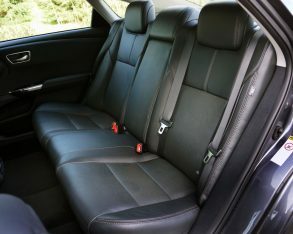 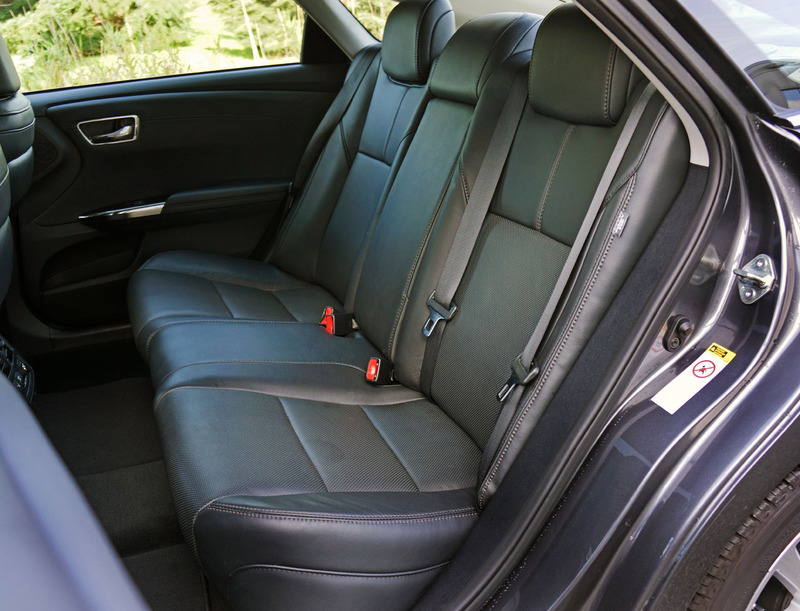 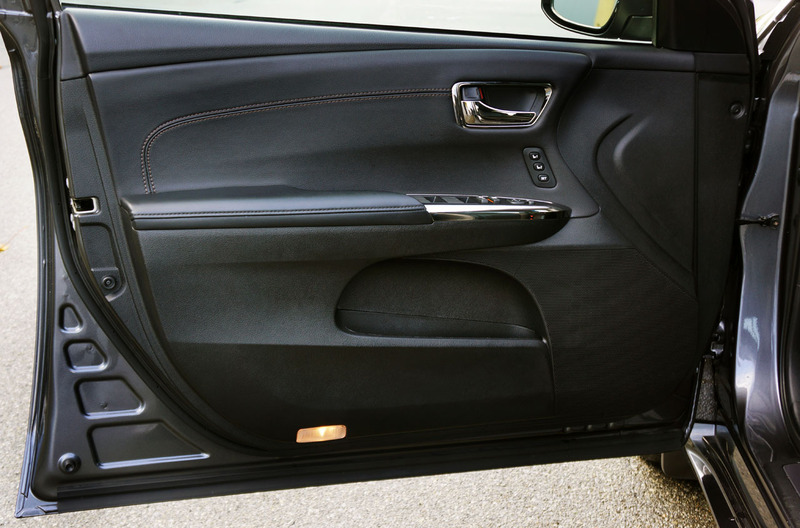 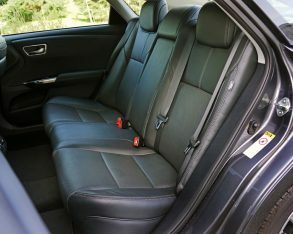 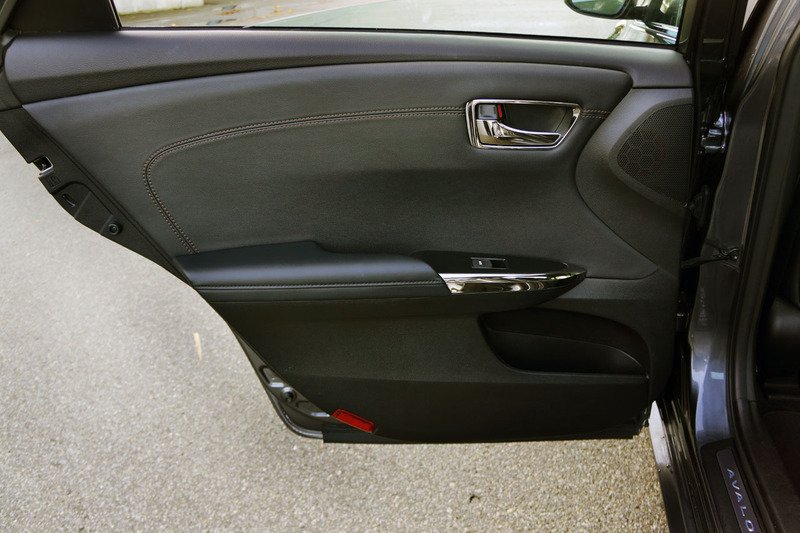 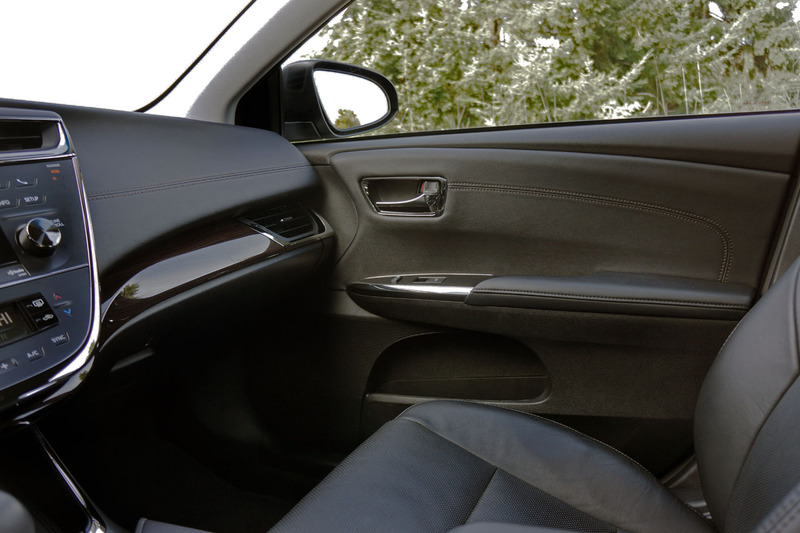 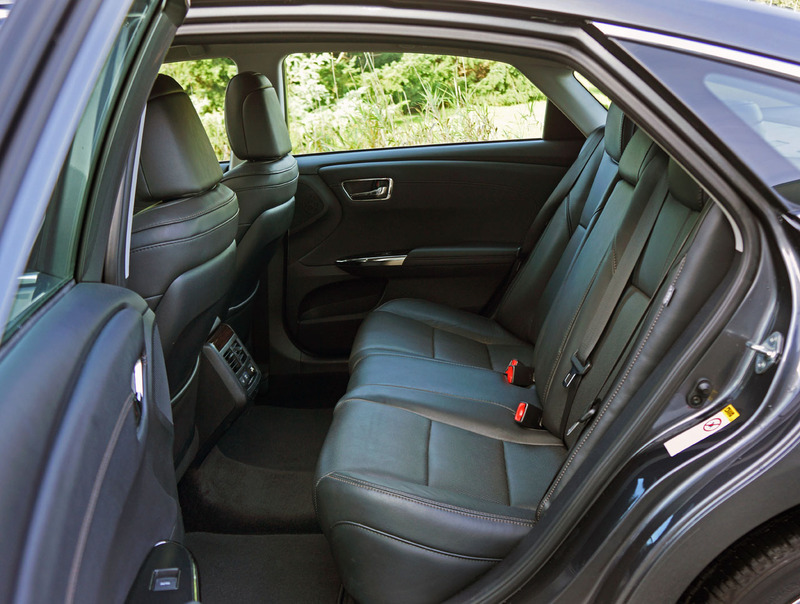 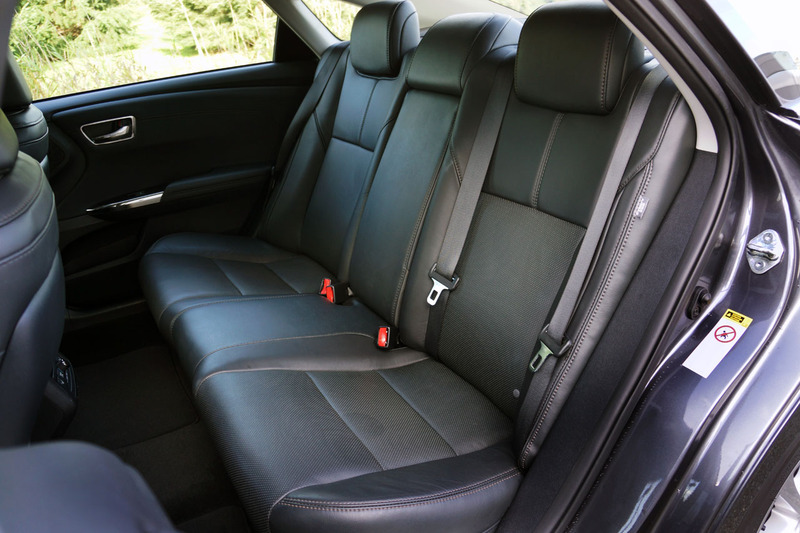 Combined with similar looking leather covering the seats, the total effect borders on breathtaking. 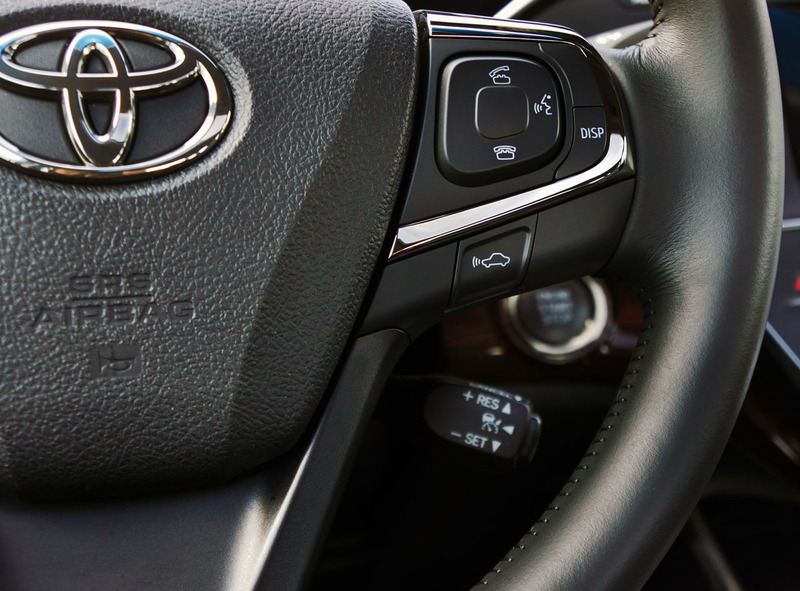 experience that’s literally cool to the fingertips. 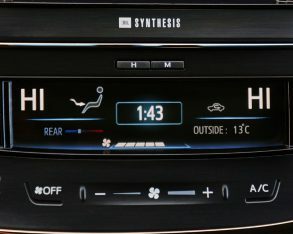 The full-colour 6.1-inch touchscreen they put into use is smaller than the new class average, but that’s ok by me as I’ve never been a fan of supersized graphics interfaces in cars. 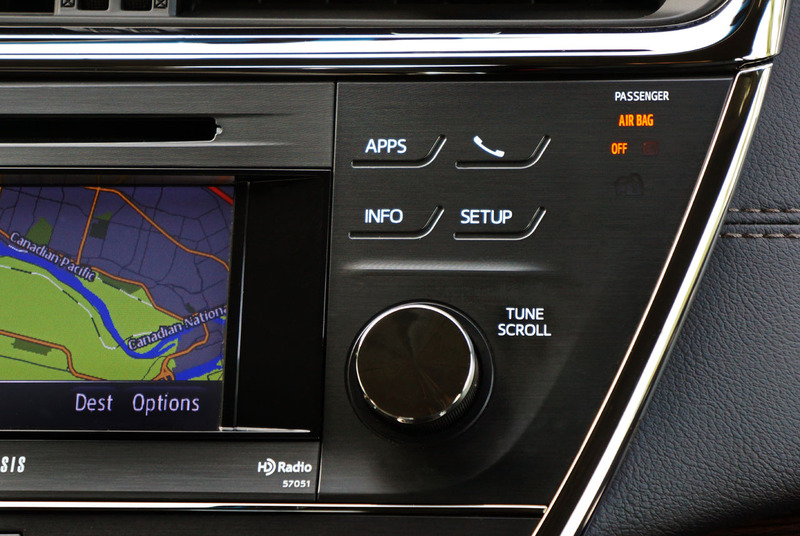 What matters here is quality, and to that end the Av’s high-resolution screen depicts deep rich blacks and bright radiant colours. 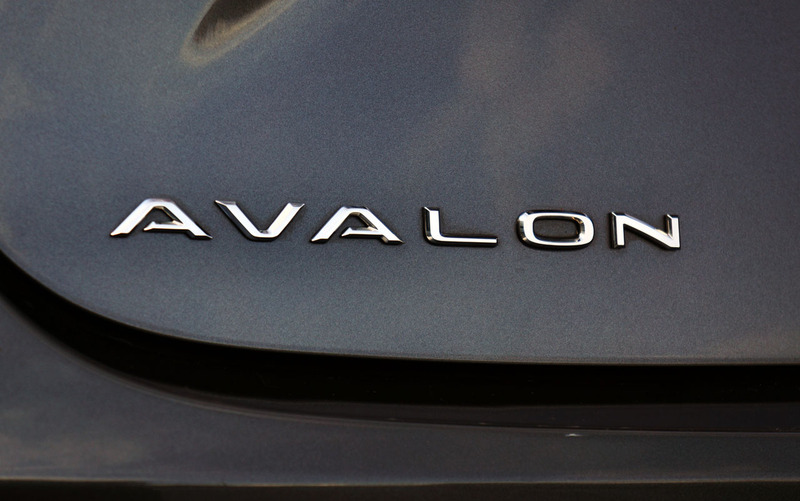 Avalon’s feature double-eye projector ellipsoid (PES) low-beams. 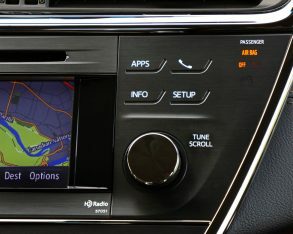 the artist, song and album art via a connected smartphone, and of course the usual AM/FM/CD/MP3/WMA functions. 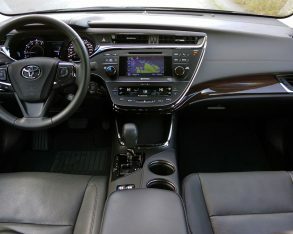 The base Avalon XLE gets all the expected safety features too, such as ABS-enhanced four-wheel disc brakes with electronic brake force distribution and emergency brake assist, traction and stability control plus the usual assortment of airbags, although the inclusion of standard driver and passenger knee airbags along with a set of airbags for the rear side thorax positions goes the extra mile. 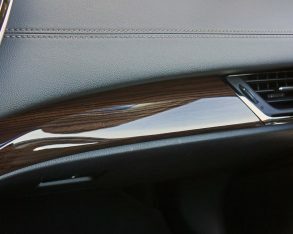 in base trim, while everything looks a lot nicer thanks to cool ambient lighting. 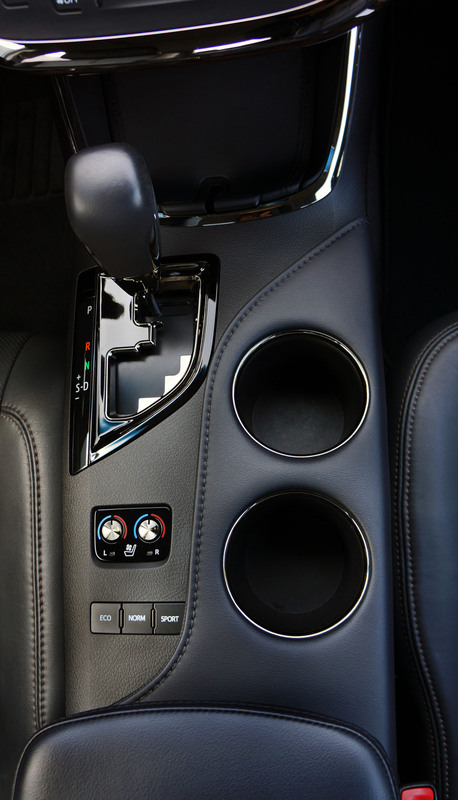 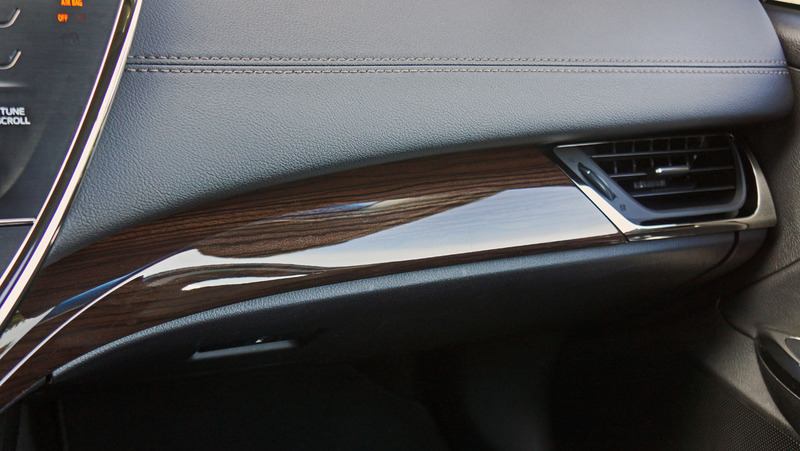 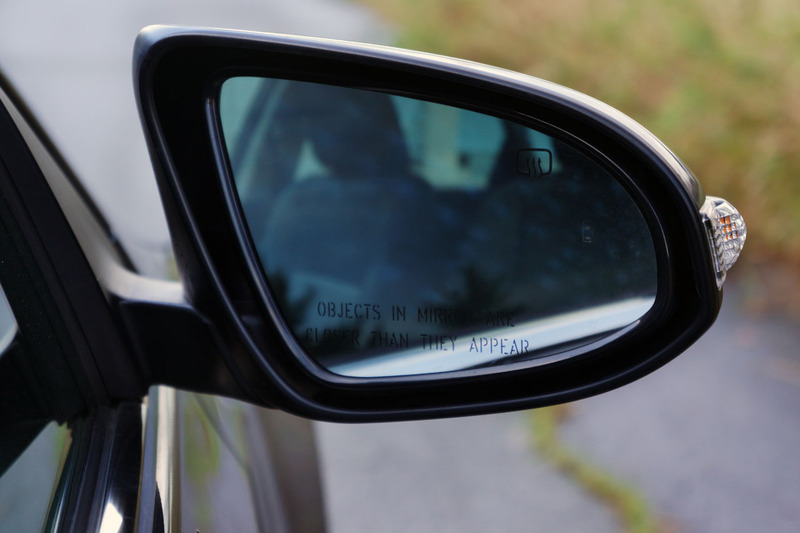 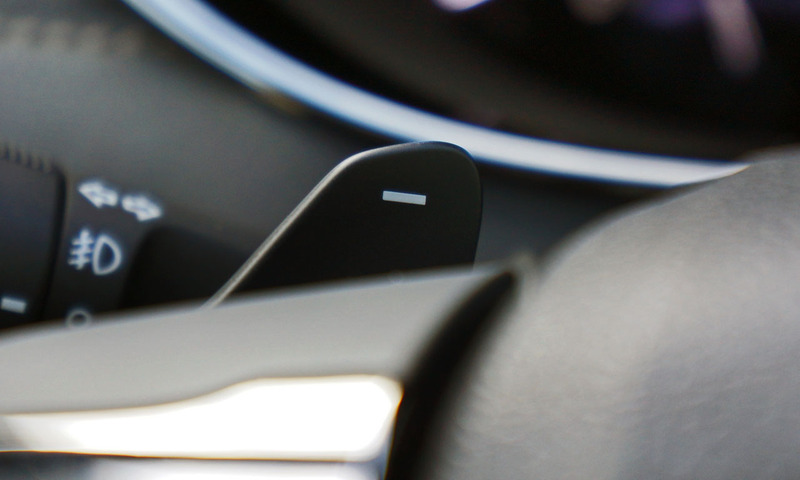 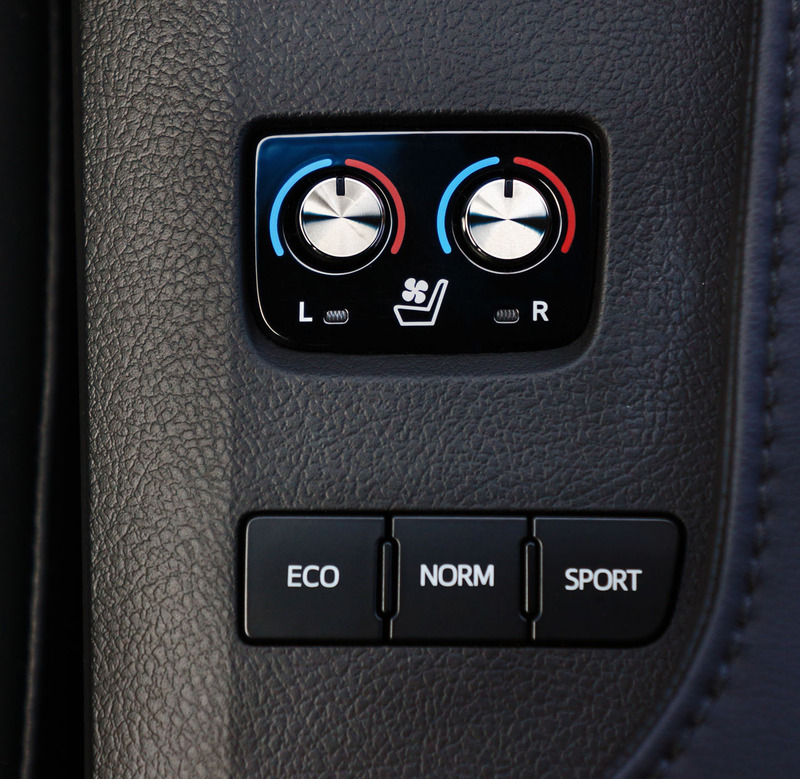 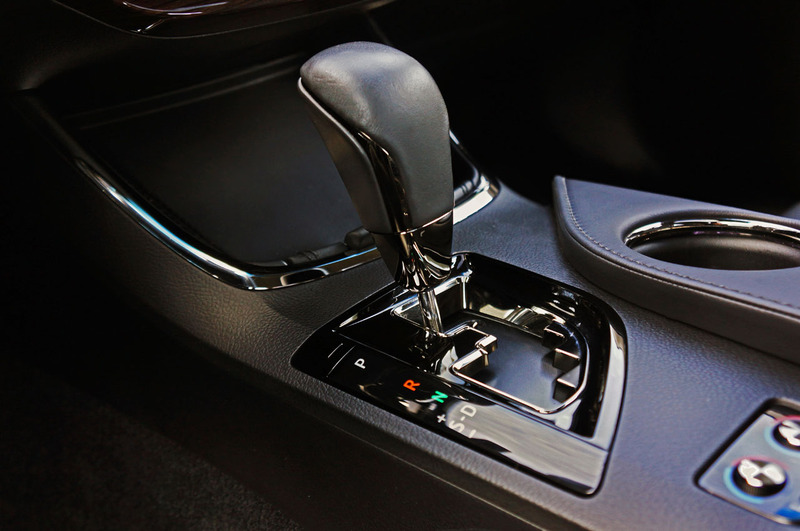 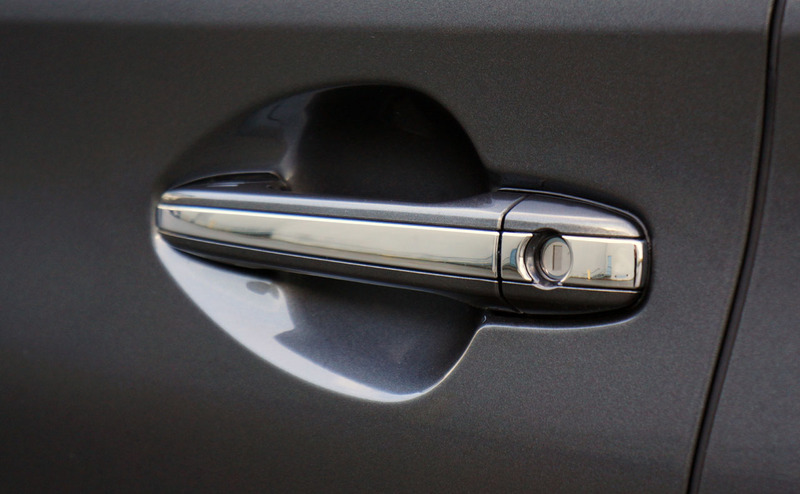 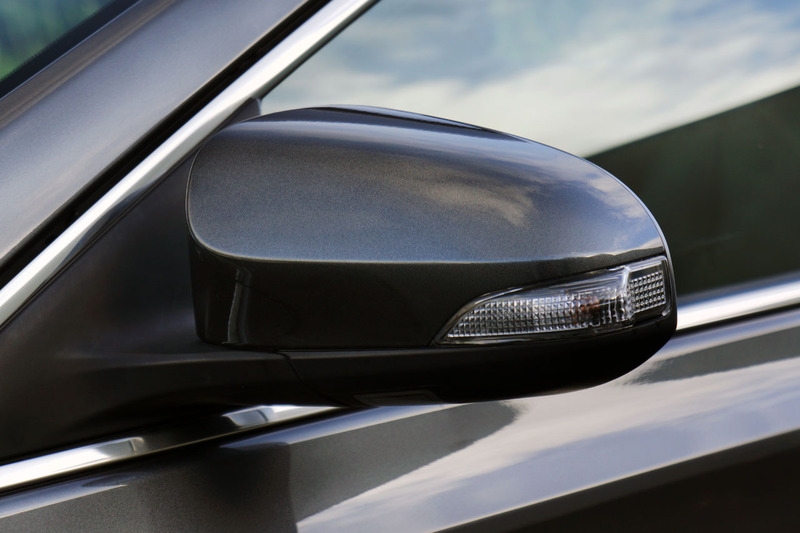 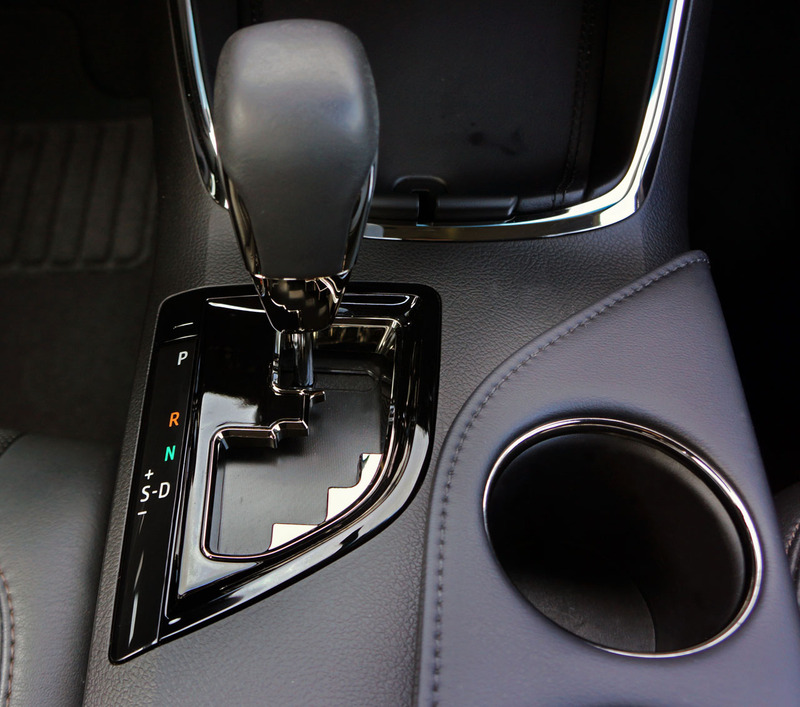 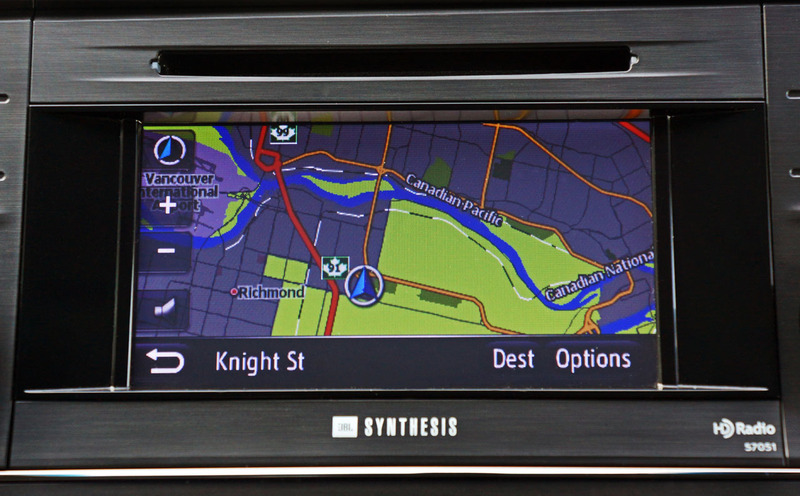 Aluminum scuff plates can be found at all four doors, while a clear and crisp TFT LCD colour climate control panel improves the look and functionality of the HVAC system. 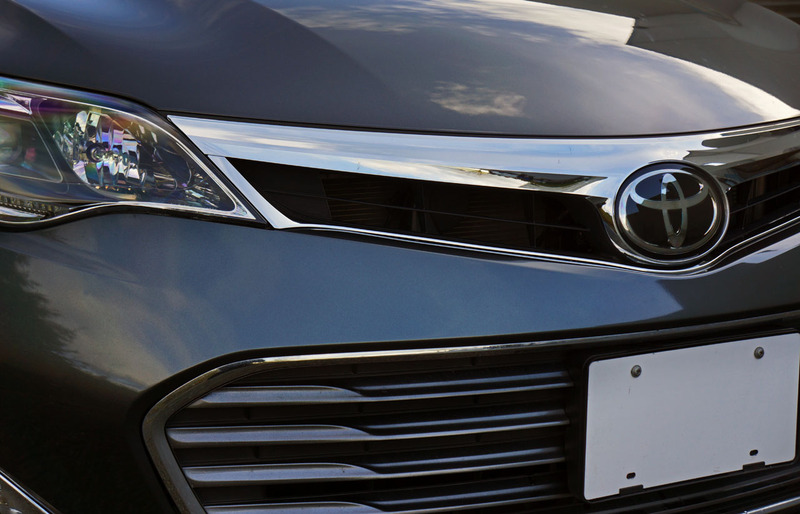 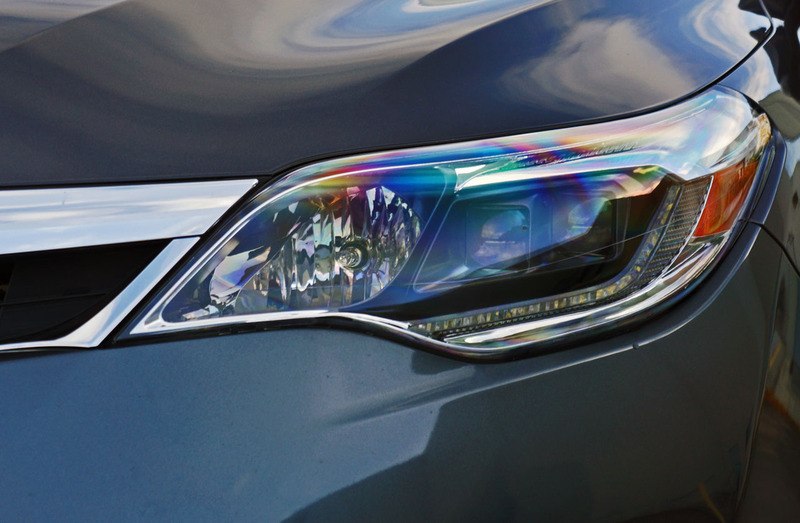 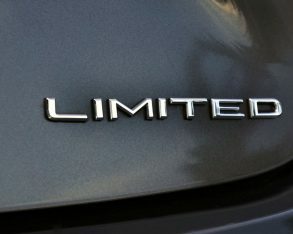 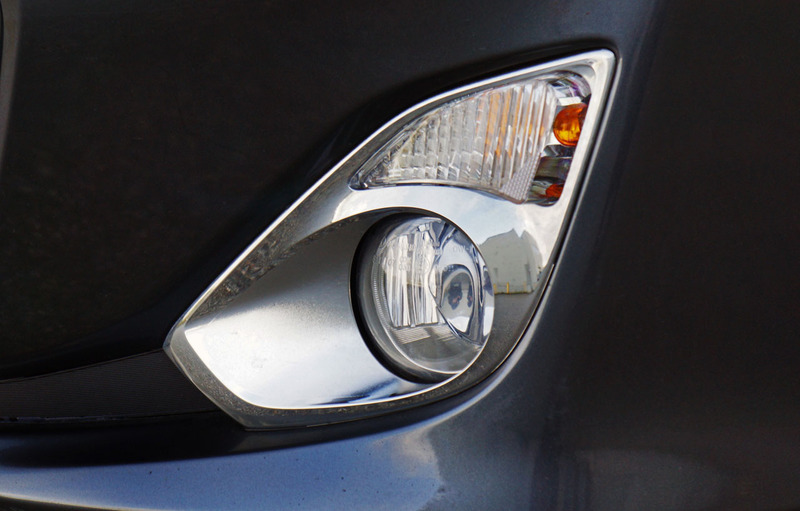 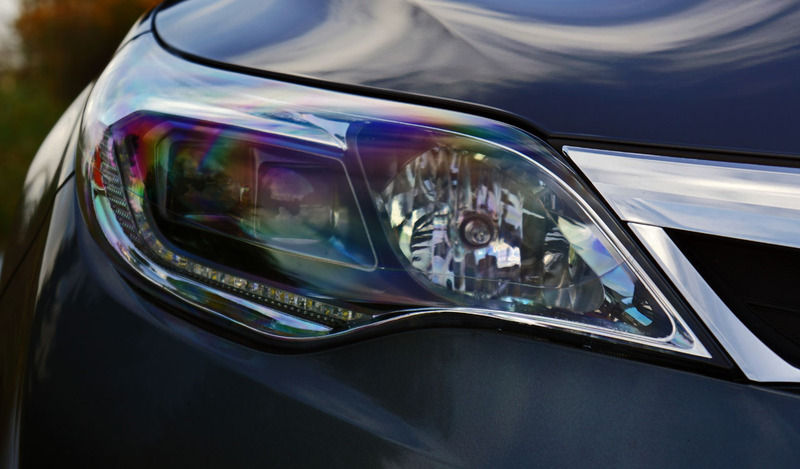 The Av Limited’s driver will especially appreciate the auto-leveling HID headlamps with LED daytime running lights, as well as the auto-dimming side mirrors with puddle lamps, rain-sensing automatic wipers, and blind spot monitor with rear cross traffic alert. 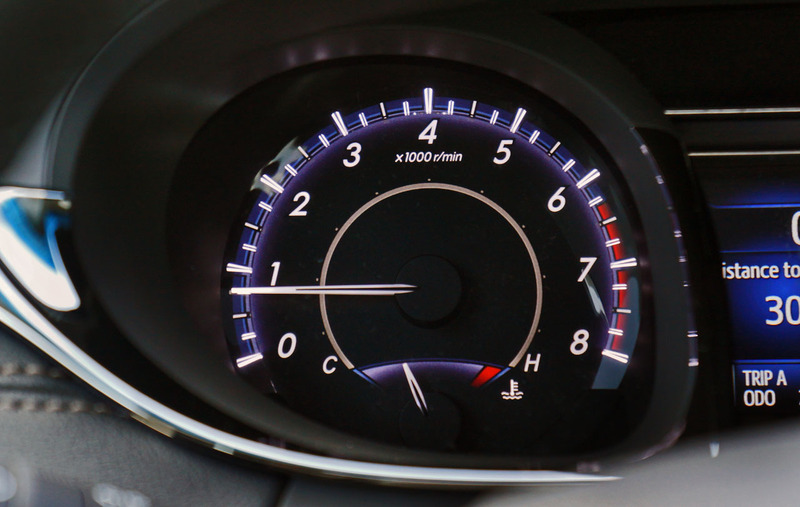 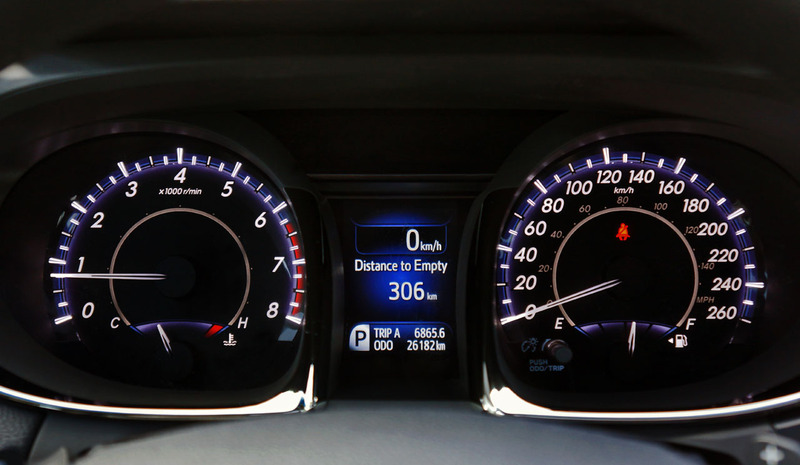 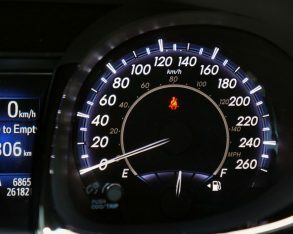 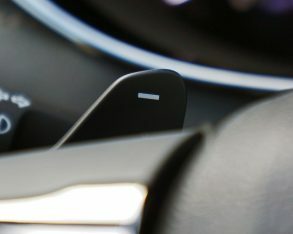 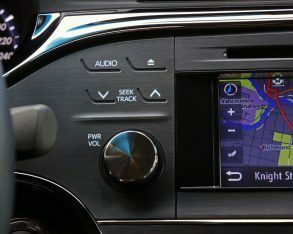 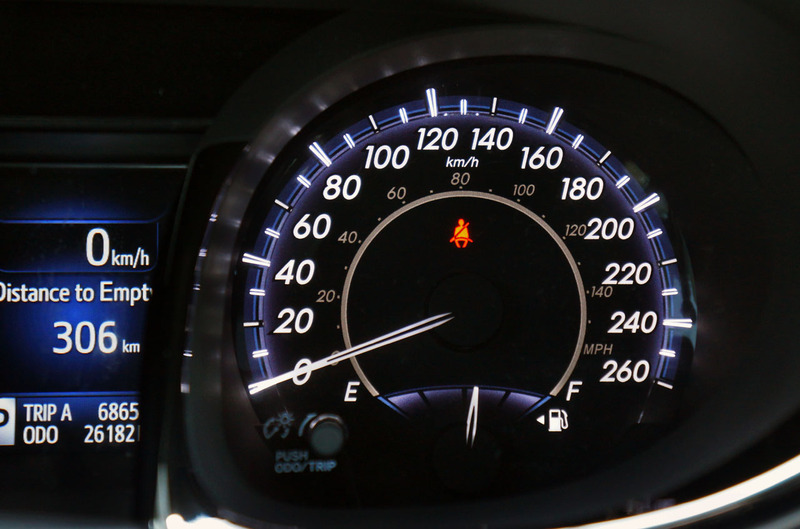 radar cruise control, a road trip favourite, while the pre-collision system gets pulled from the automaker’s Lexus brand to make this flagship as safe as possible. 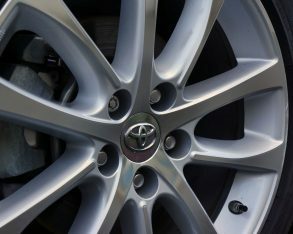 is more direct than expected and responds well to input, while its standard 225/45R18s dig into the tarmac with ample grip. 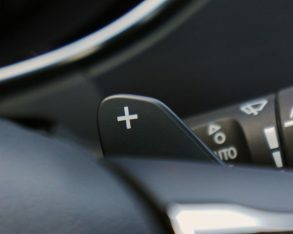 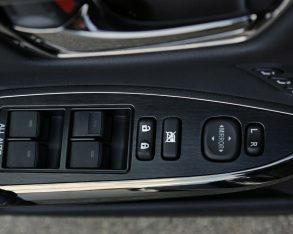 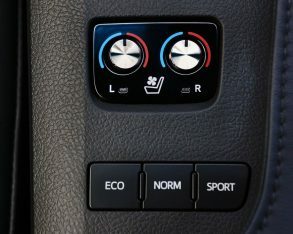 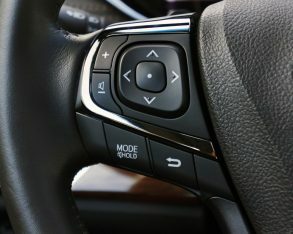 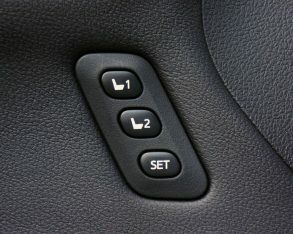 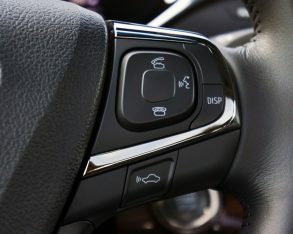 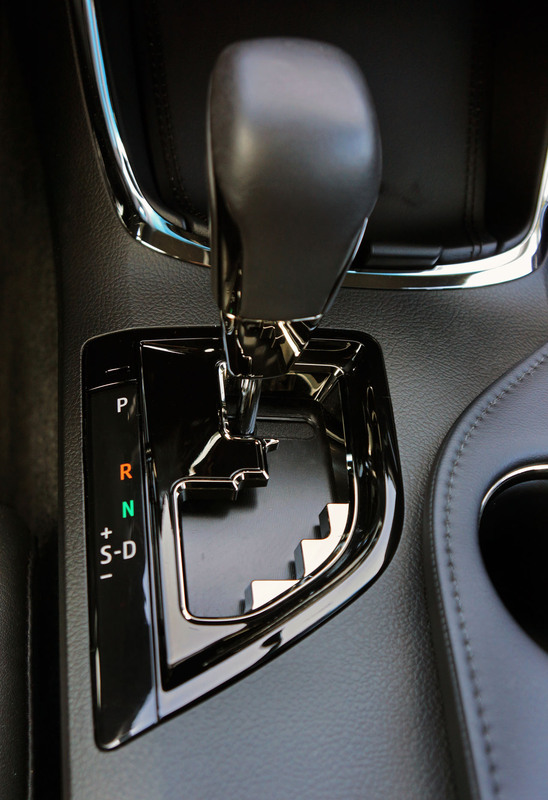 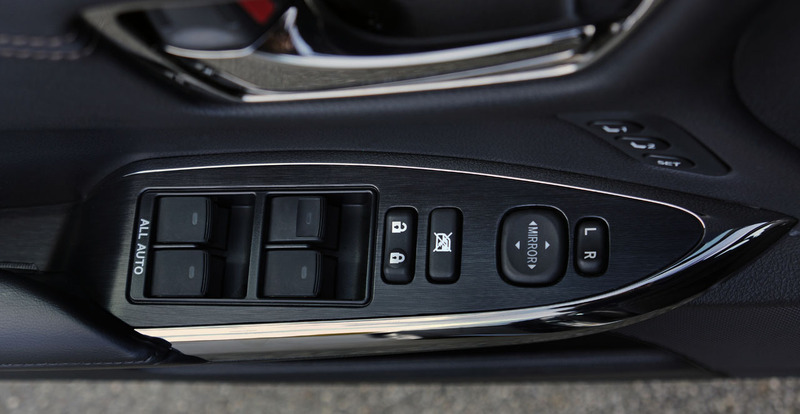 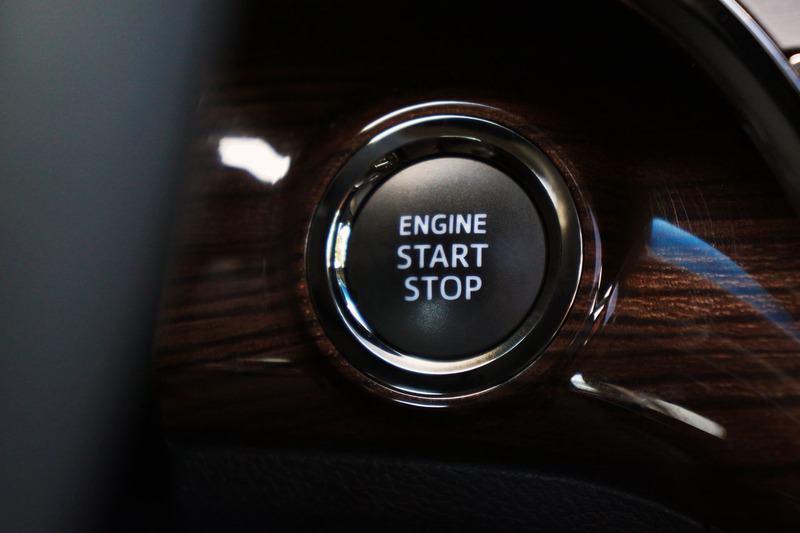 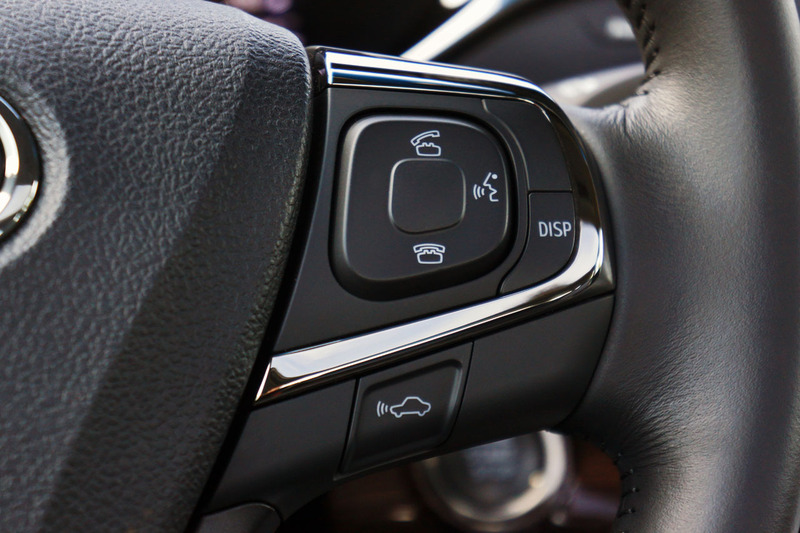 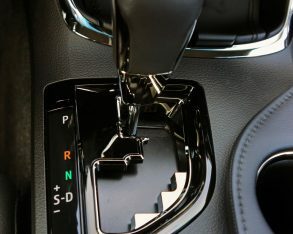 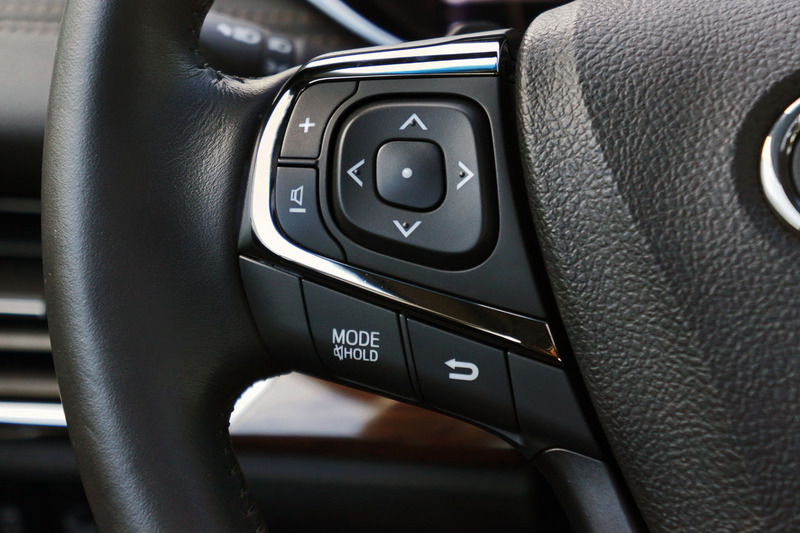 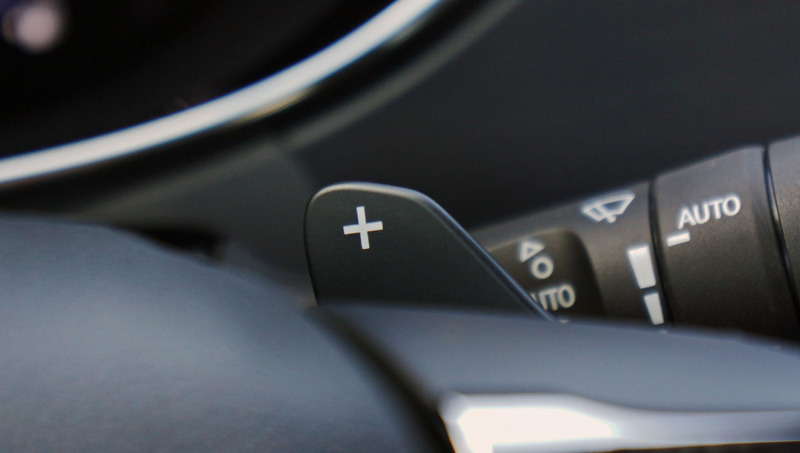 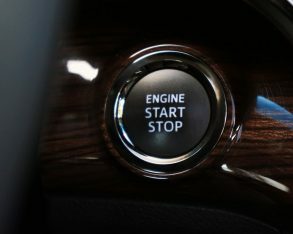 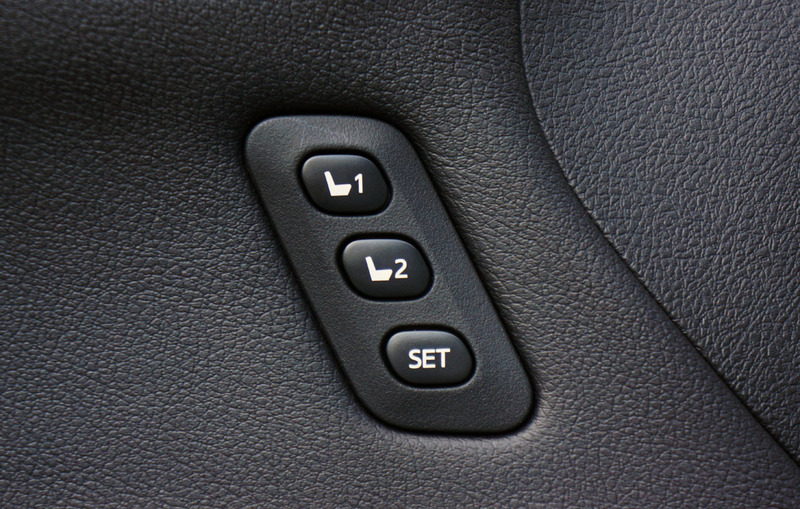 Its vehicle stability control comes with an off switch just in case you want to burn some rubber, although it’ll probably get used more by those in the snow belt attempting to extract the car from the aftermath of a well-meaning (or just downright mean) snowplow driver. 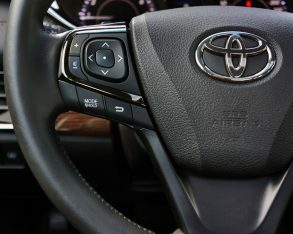 I left it alone, but I did play with the standard Drive Mode Select button, which allows selection of a fuel-saving Eco mode, plus normal and Sport modes, the latter quite effective with quicker shifts from the six-speed automatic, which incidentally gets steering wheel-mounted paddles for a more engaging driving experience. 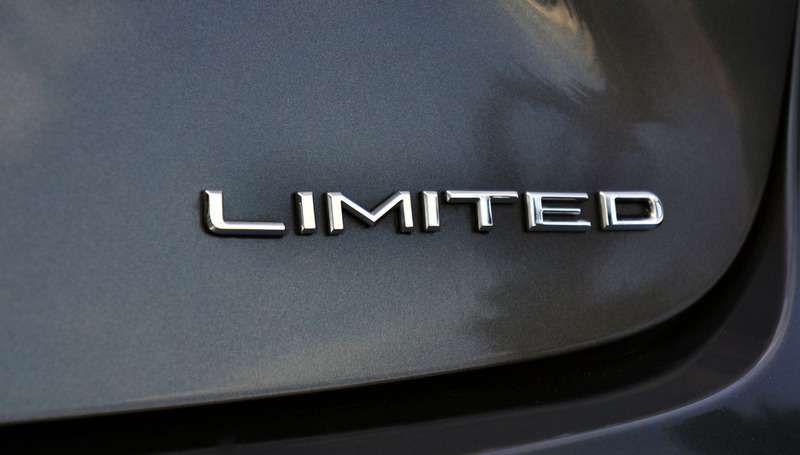 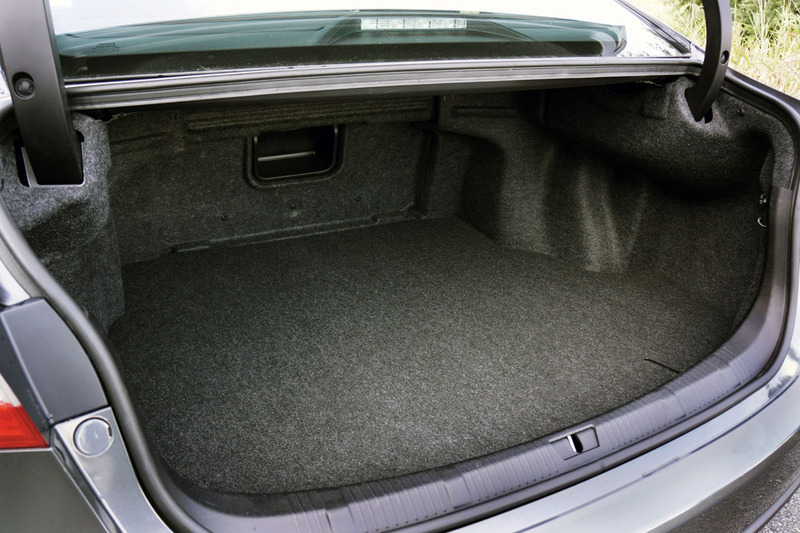 One of the reasons the Av can make use of such sporting equipment is a relatively light curb weight of only 1,610 kilos (3,548 lbs) in base XLE trim and 1,625 kilograms (3,582 lbs) for the as-tested Limited; weight almost always being the fun detractor of any car. 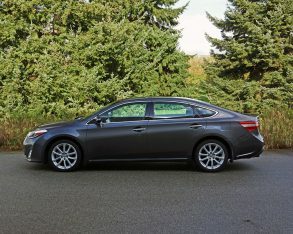 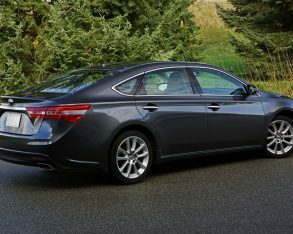 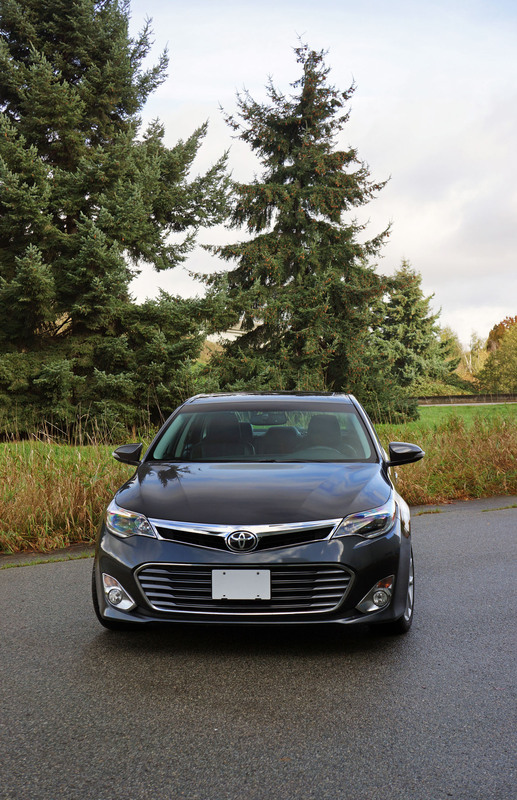 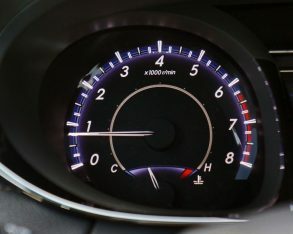 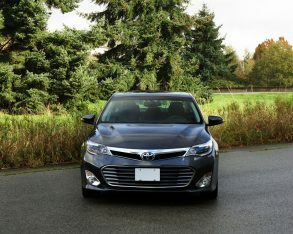 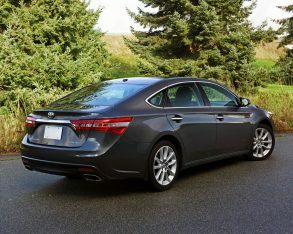 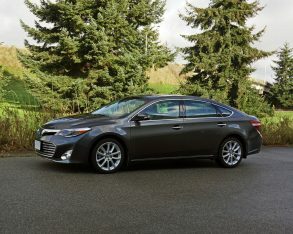 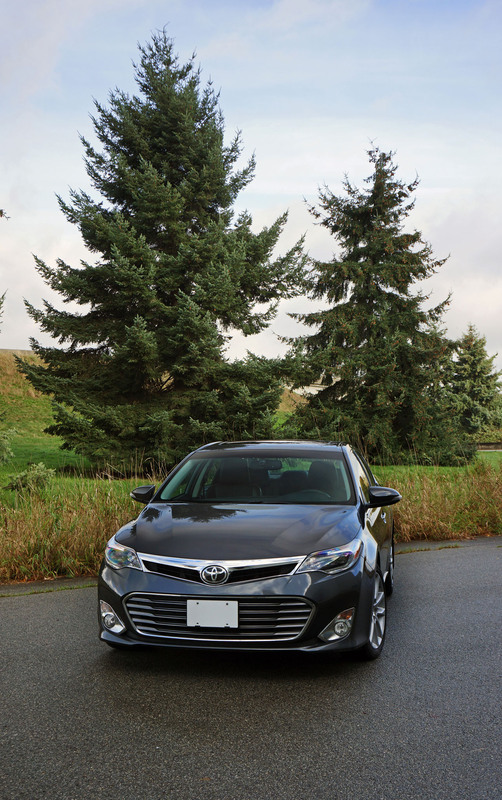 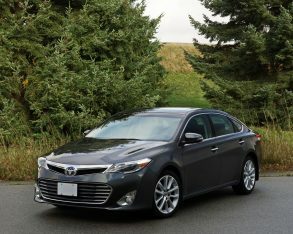 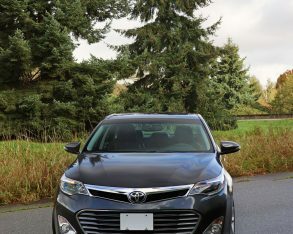 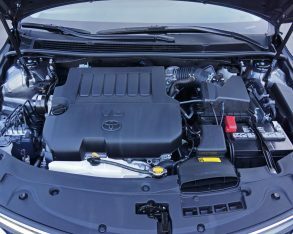 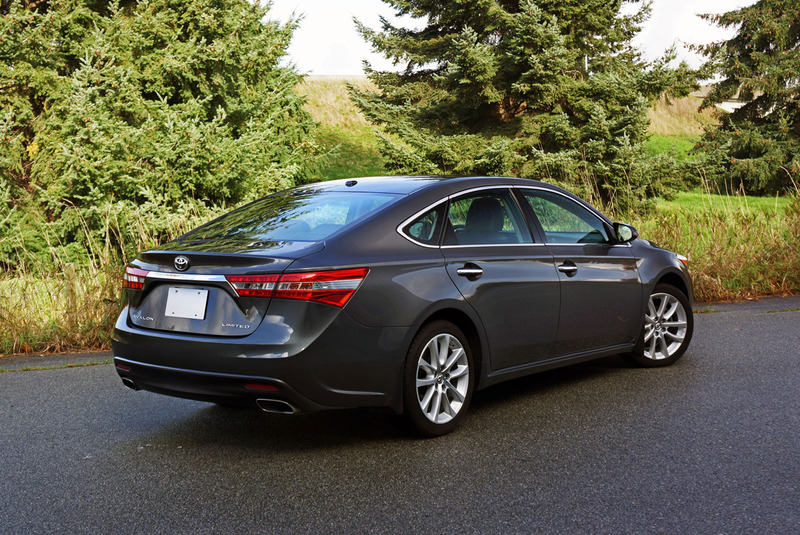 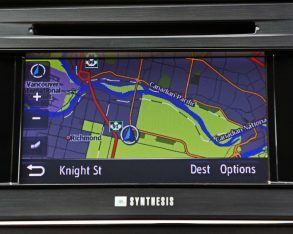 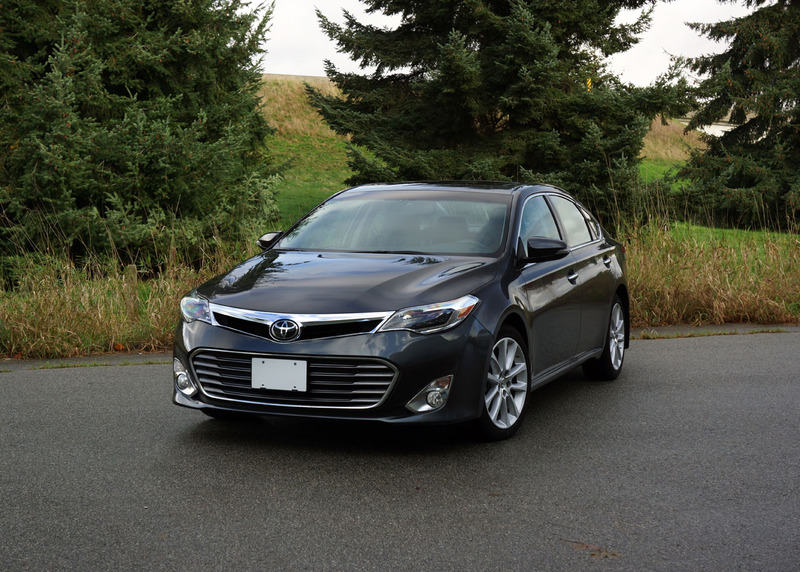 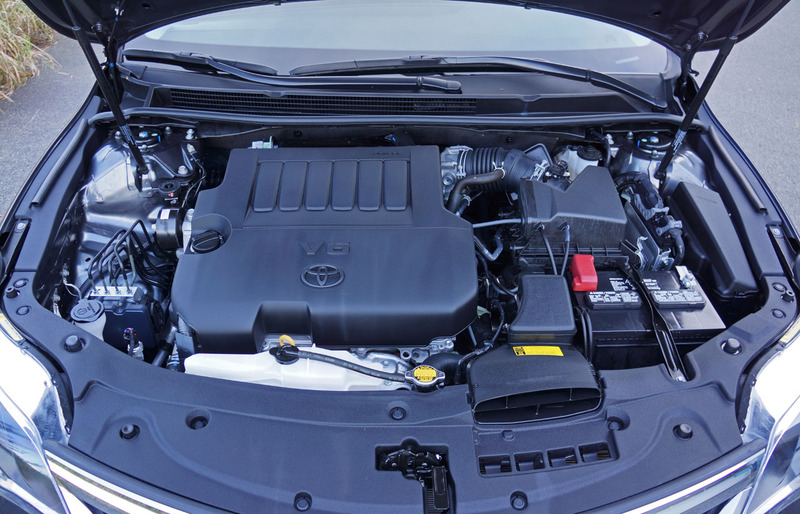 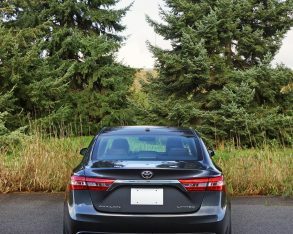 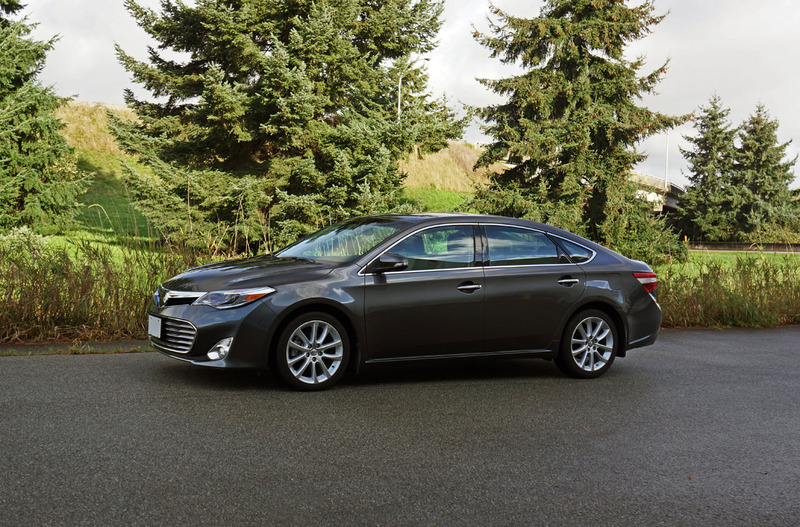 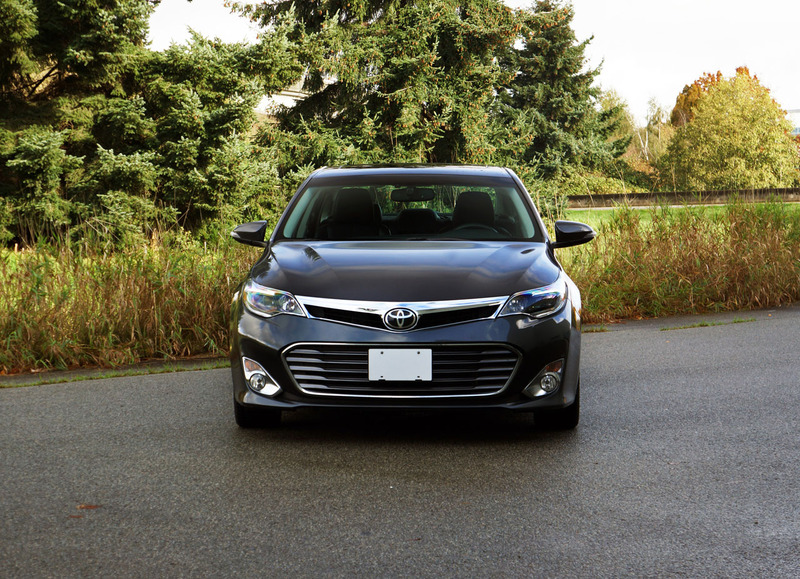 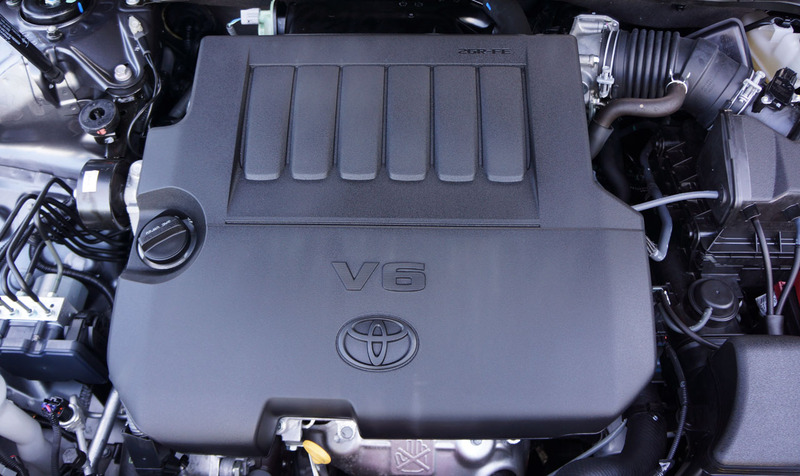 is also a big negative to fuel economy, the Avalon’s excellent 11.3 L/100km city, 7.5 highway and 9.6 combined claimed rating another example of how Toyota got this car right. 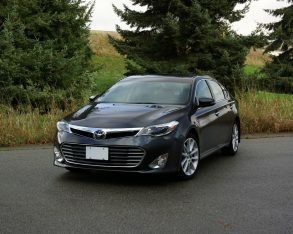 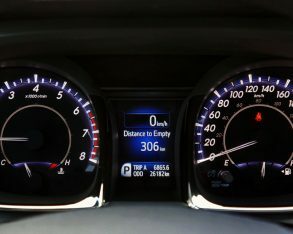 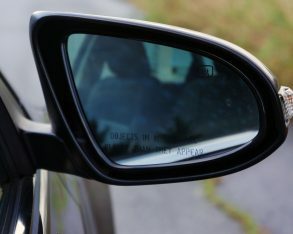 In a previous weeklong test of a 2013 model the Av’s trip computer registered 12.3 L/100km as a combined average, while my calculations were even better at 11.5, which is superb for a large luxury sedan. 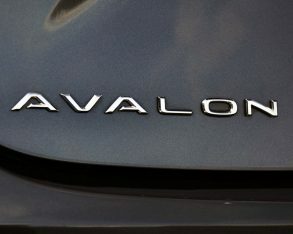 The Avalon’s slick 0.28 coefficient of drag no doubt helps its highway rating, while doing a good job of keeping wind noise at a minimum. 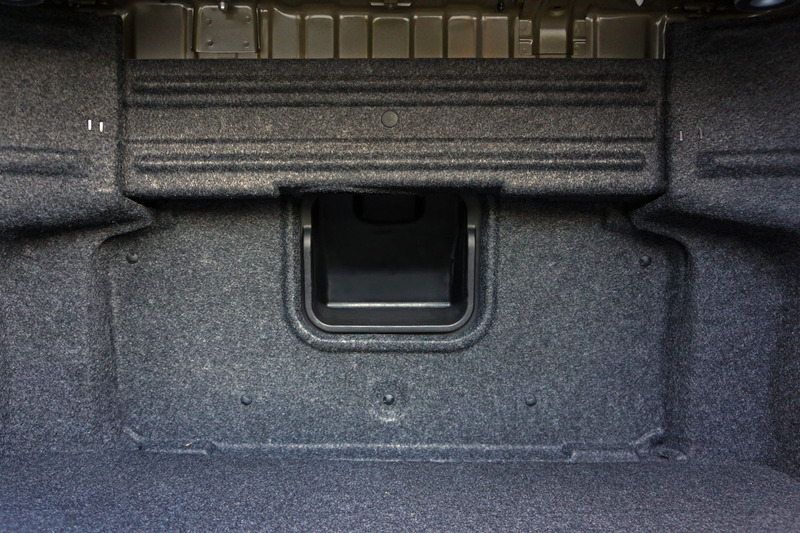 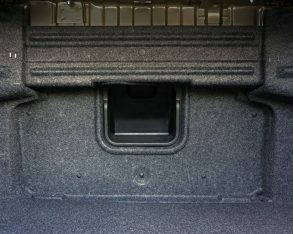 Additionally, Toyota makes certain NVH levels are reduced further with sound absorbing acoustic glass and lots of insulation in all the right places. 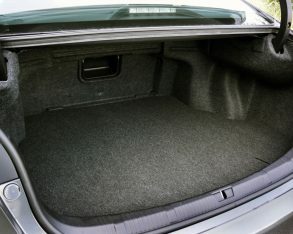 flat when loading longer items into the trunk. 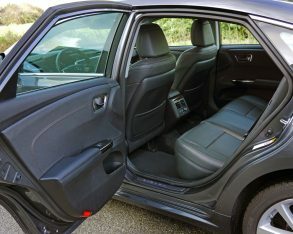 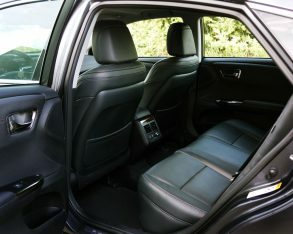 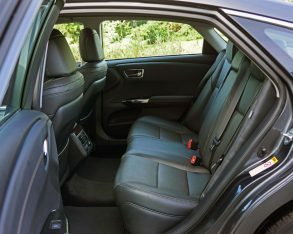 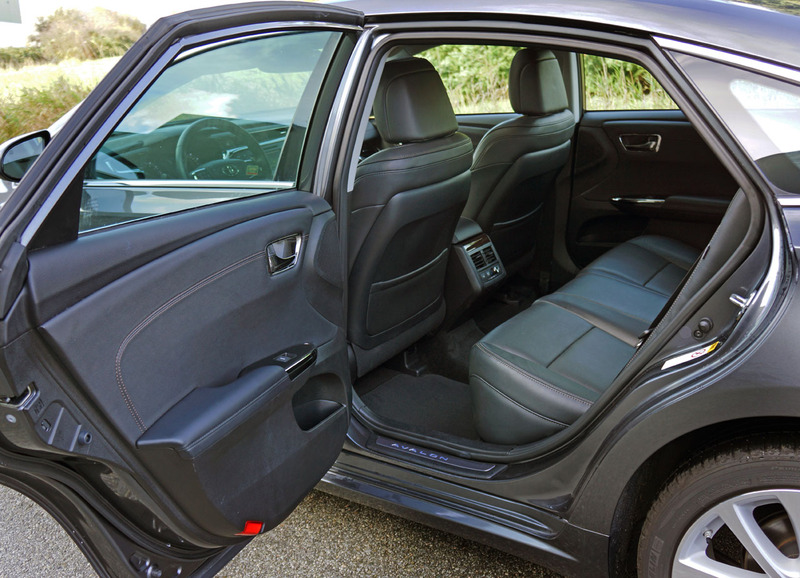 It’s a fairly big cargo hold at 453 litres capacity, 17 litres larger than a Camry, and the pass-through behind the rear seat armrest is handy for long, thin items, but you’ll need a rooftop carrier if you plan to take four adults skiing. 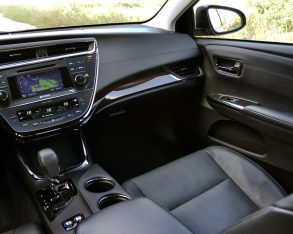 I’m going to take another stab in the dark by guessing that if you’re an avid skier you probably already own something similar to the new Highlander, making luggage capacity and features like pass-through systems irrelevant. 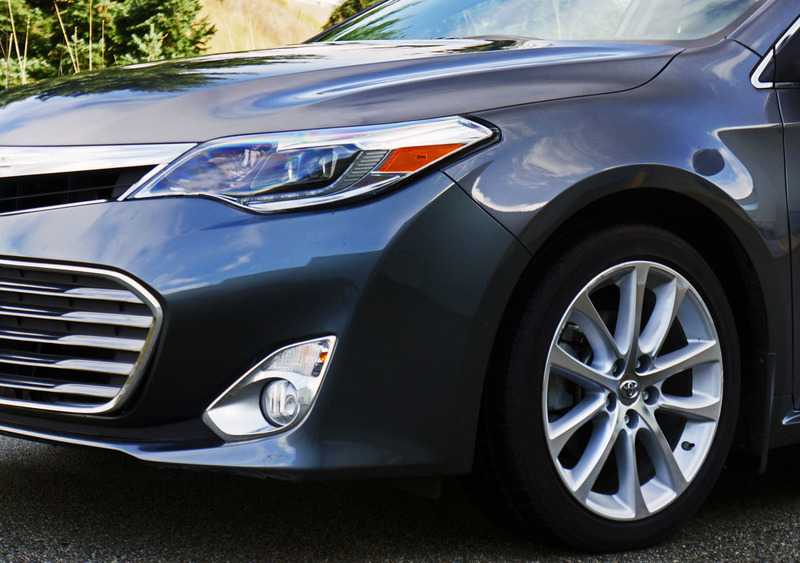 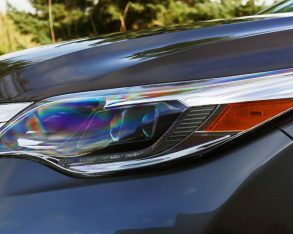 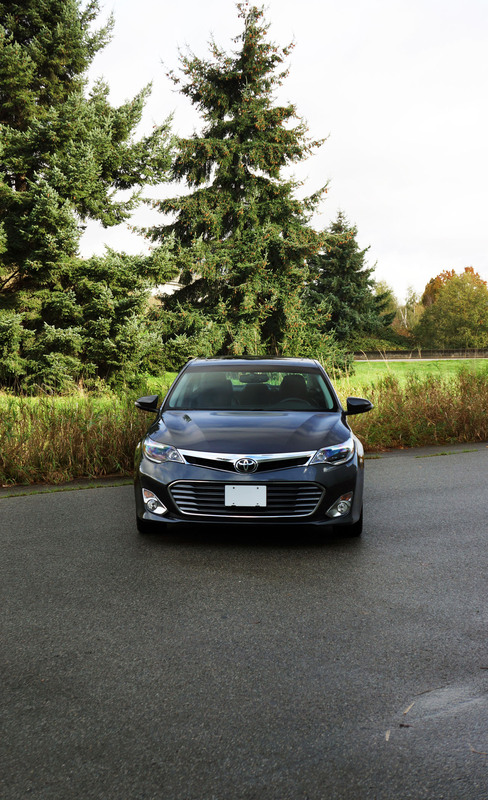 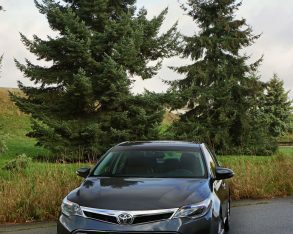 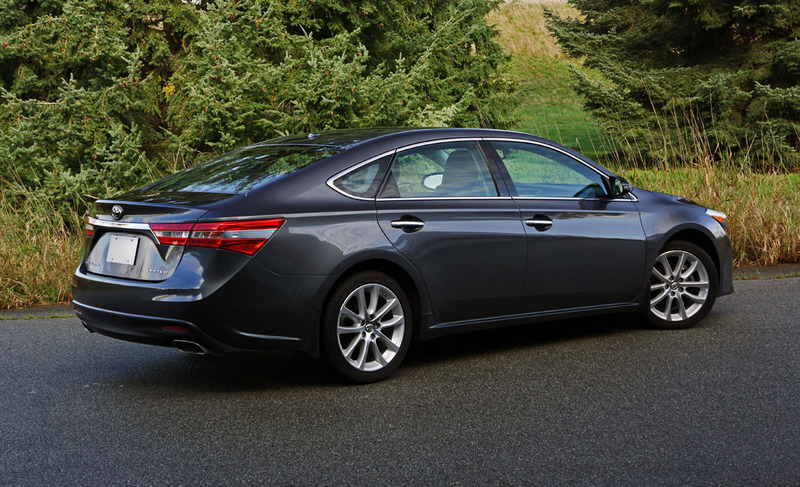 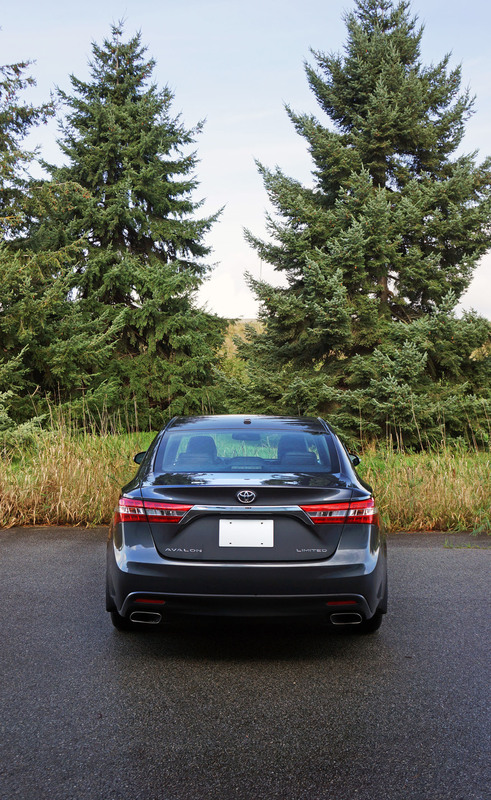 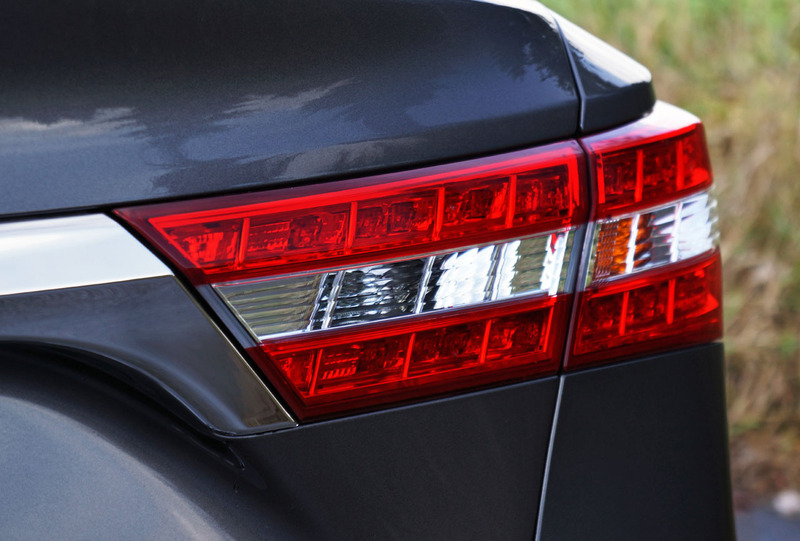 Large crossover SUVs that come similarly equipped to this Avalon are why full-size sedans don’t sell in the same numbers as they used to, but spend some time in Toyota’s flagship luxury sedan and you’ll likely want one, it’s just that good.